Mr. Ernst here. 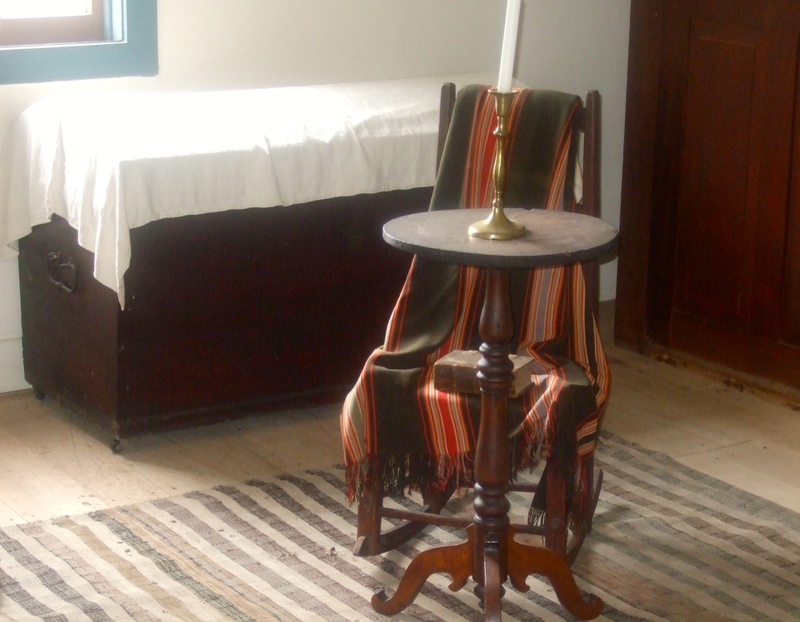 This month the focus is on a surprise that turned up when researching a specific scene in this book, the fourth in Kathleen’s award-winning Chloe Ellefson Historic Sites mystery series. 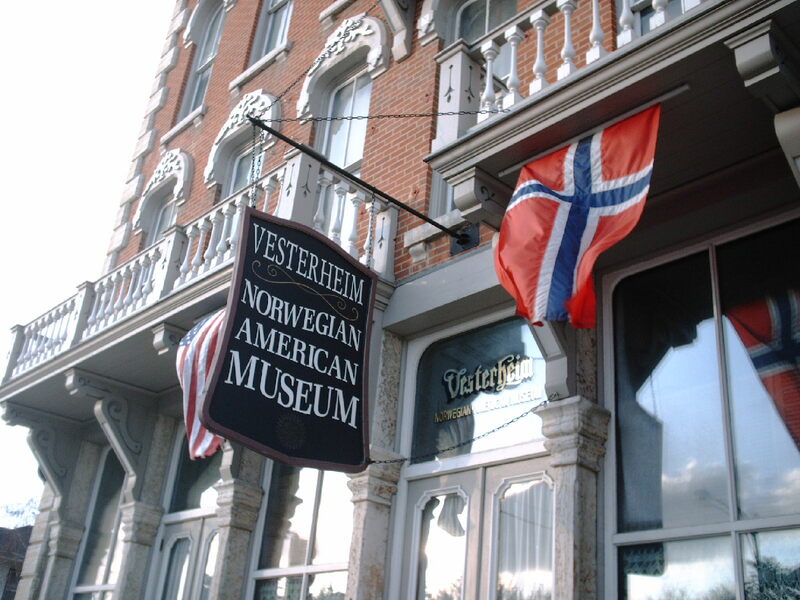 Heritage Of Darkness (HOD) takes place within and around the wonderful, world-class Vesterheim Norwegian-American Museum in Decorah, Iowa. 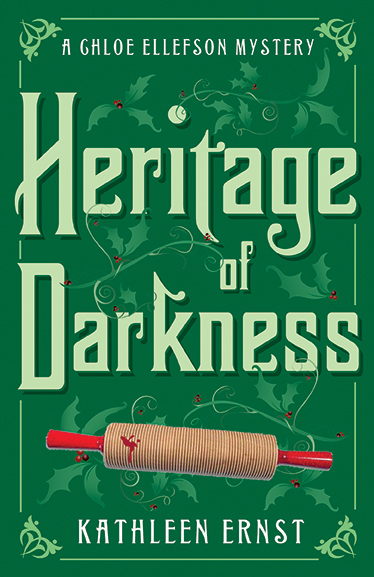 The story is set during December 1982, with historical flashbacks to the 1940s and 1960s. 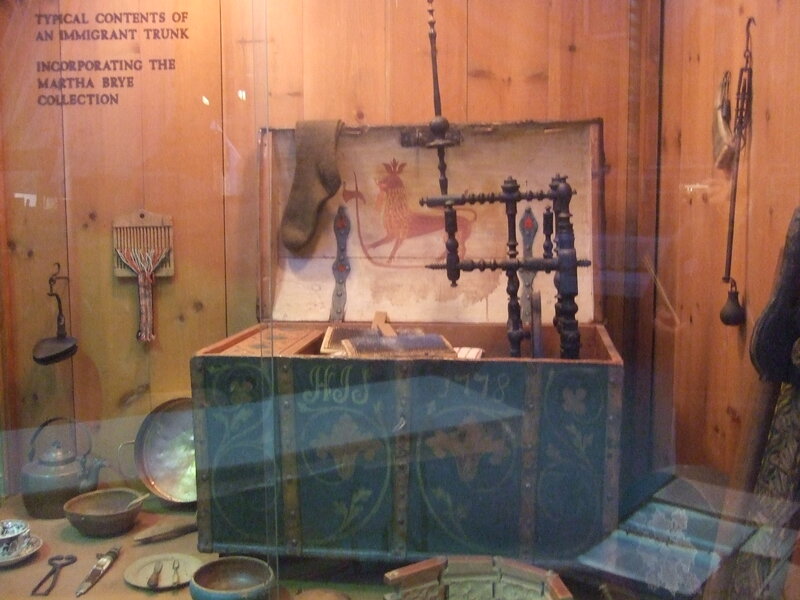 This is the first Chloe mystery set at an historic site outside of Wisconsin. 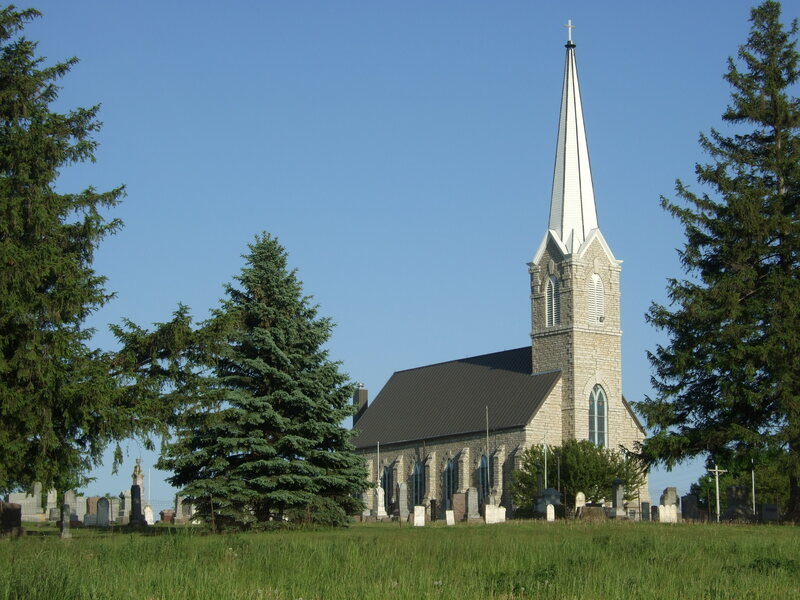 Other ‘out-of-state’ stories follow, but Kathleen intends to keep Chloe and Roelke firmly rooted at Old World Wisconsin and the Village of Eagle. 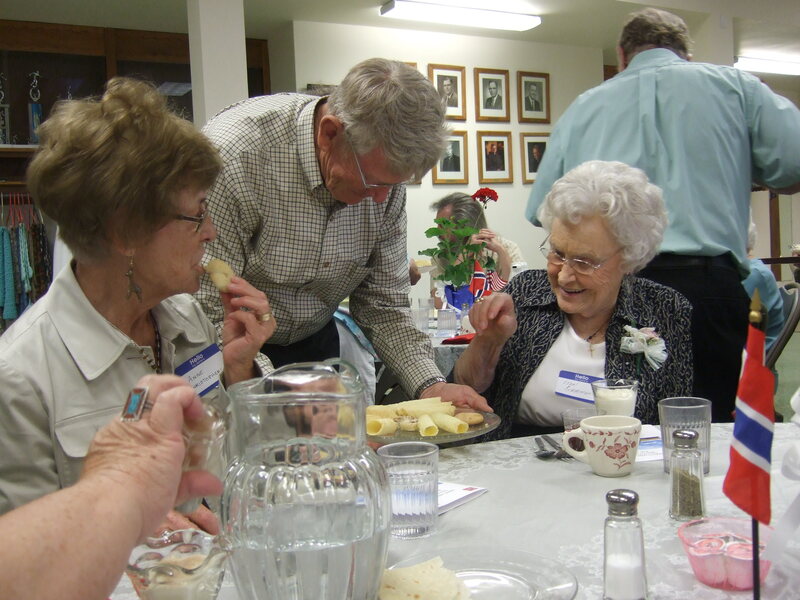 As Kathleen crafted HOD, she decided to add an attempt on Roelke’s life. Part of the farm’s appeal was its proximity to a bridge over the river. Roelke would have to cross it when making the one-mile walk between the farm and Vesterheim where he was taking a Norwegian chip carving class. The solitary red pin on the upper right side of the satellite image below shows where the bridge is located. 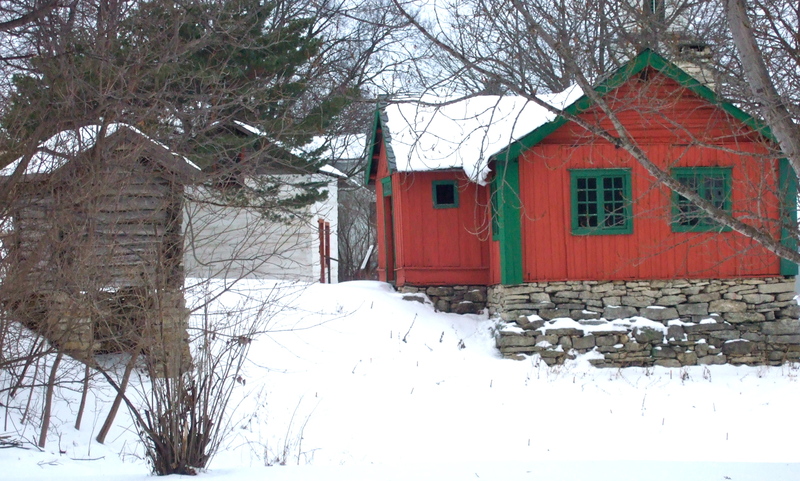 Kathleen and I initially scouted the book’s locations in warm weather, but given that HOD is set in December, we re-documented them in winter. The modern bridge looked new enough that we decided to confirm it was there in December 1982. 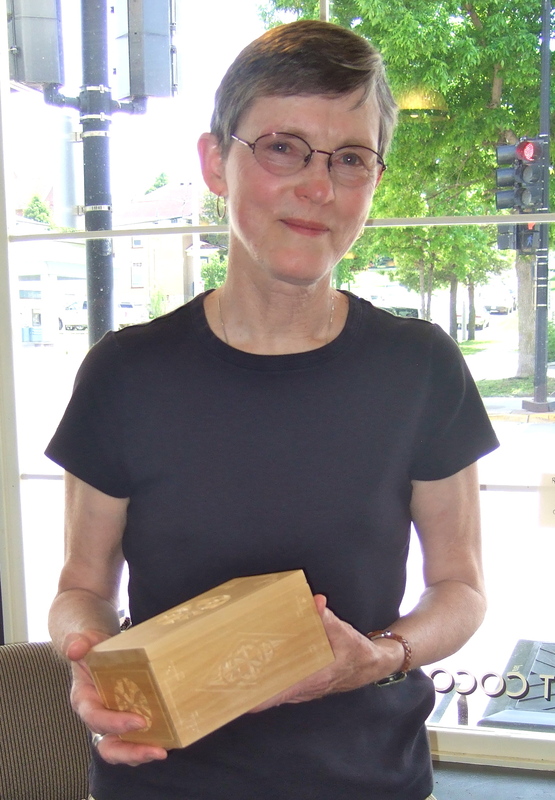 Local Archivist Midge Kjome directed me to bridge-related newspaper clippings and photos in the files of the Winneshiek County Historical Society . . . where I found the following. Well, hunh. There was no bridge there when the ‘bridge’ scene was set! Note from Kathleen: I hate it when that happens. Making matters even worse, I discovered that the original “Twin Bridges” was an historic iron truss structure built circa 1880. It had just one-lane, no lighting, and lacked a sidewalk. It also had low, skimpy side-barriers, and offered a steep drop to the river. In other words, it was perfect for the scene Kathleen envisioned. As her readers know, Kathleen is a real stickler for historical accuracy. It’s the museum curator in her. In this case she made an exception, wielding her literary license to shift the tractor-bridge crash forward in time until after the book concludes. Problem solved. Below is an excerpt from the resulting scene, which starts on page 284. Roelke walked north and east to the sounds of boots crunching snow and shovels scrapping sidewalks. The wind drove snowflakes almost sideways through the cones of light cast by street lamps. This may not have been my best-ever idea, Roelke thought as he approached the Upper Iowa River bridge. He was dressed well for wintry weather, but the snow was slowing him down. Best try to pick up the pace. There were no lampposts on the bridge. He dug his flashlight from his pocket and scanned the single traffic lane, hoping to identify any additional icy spots. There was nothing to see but snow and the twin ruts of tire tracks. He set out again, this time keeping a hand on the railing. The car didn’t slow down. As it hit the bridge the yellow beams went crazy, slicing the snow-hazy night. The vehicle was a dark blur, whirling, sliding, coming his way–Christ Almighty–coming his way and there was nowhere to go, nowhere to go. 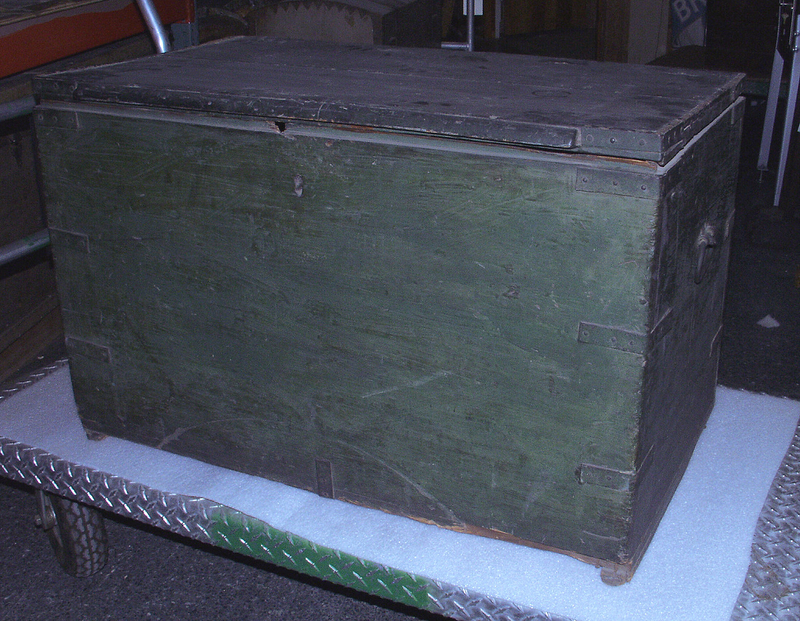 The bridge railing bore into Roelke’s hip until something had to give, bone or iron, and the car kept coming. Roelke leaned out over the river, away from the speeding mass of steel. He heard the relentless shussh of skidding tires. The car was seconds away from crushing him. Instinct pushed him over the railing in a wild twisting scramble. He managed to catch one vertical bar with his right arm. His other arm shot around too, and he clenched his right elbow with his left hand. The car hit the railing inches beyond the spot where he now dangled. The bridge shuddered. Roelke clenched every muscle. The car fish-tailed once or twice before the driver was able to straighten it out. Then the car accelerated on toward town. Roelke watched the taillights disappear with stunned disbelief and rising fury. We’d love to hear what you think, now that you’ve had the chance to compare the scene with some of the historical research used to write it. Please feel free to leave us a comment below. HOD is available in trade paperback and multiple ebook formats from independent booksellers as well as Amazon and other online resellers. 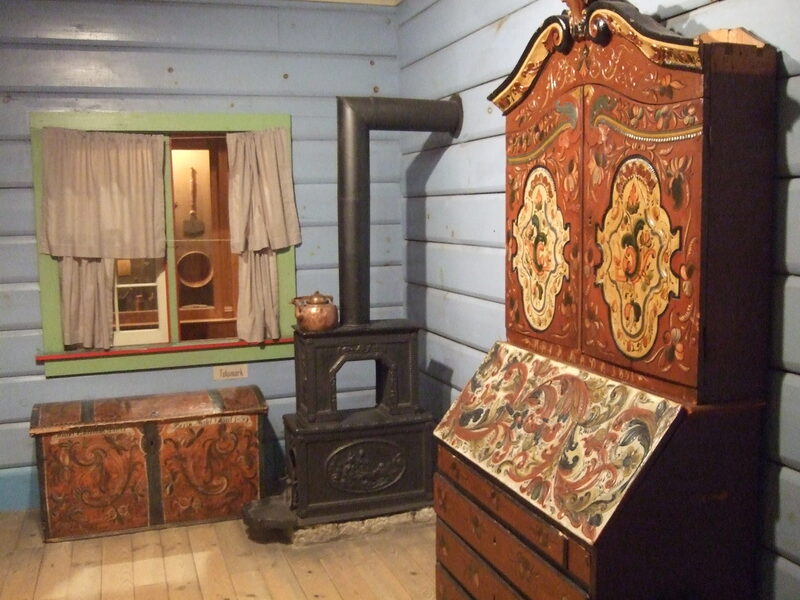 Both formats includes a map of Vesterheim, photos of the Norwegian folk art featured in the book, plus a cast of characters. 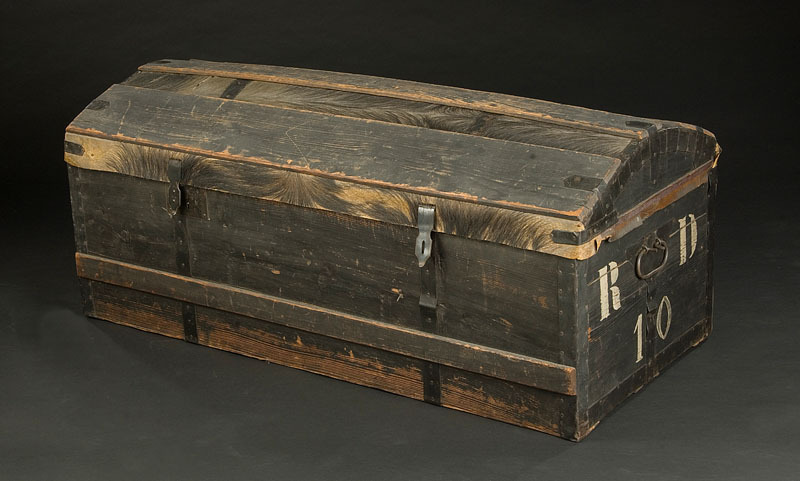 Hopefully this article has piqued your interest in discovering more about the ‘people, places and the past’ that went into making HOD. You can find a page full of details about it on Kathleen’s website, including a discussion guide, the Google map, the recipe for a dish served in the story, a slide show of objects featured in the book, public radio interviews with Kathleen, plus additional blog posts, links to booksellers that offer HOD — and more — using the link below. 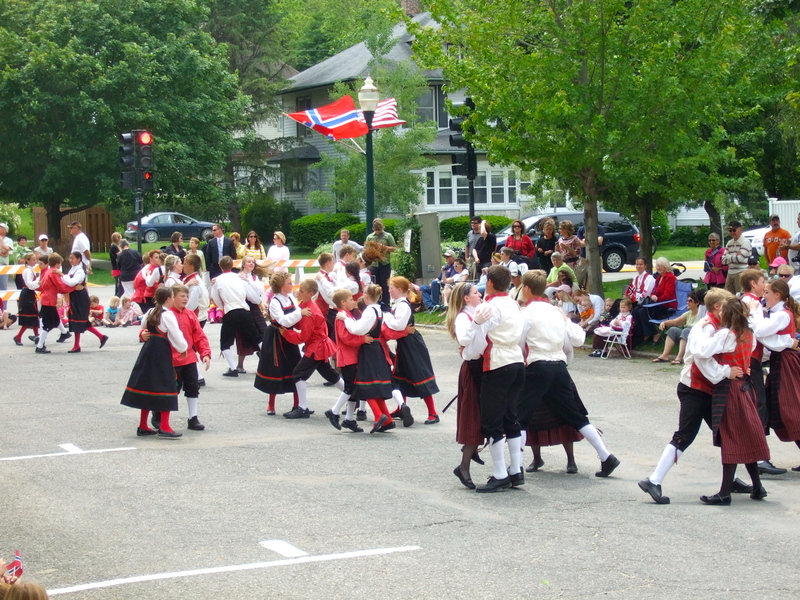 Next month I’ll post an article on this blog about researching the next book in the Chloe Ellefson mystery series, Tradition of Deceit, which takes place in Milwaukee and Minneapolis. 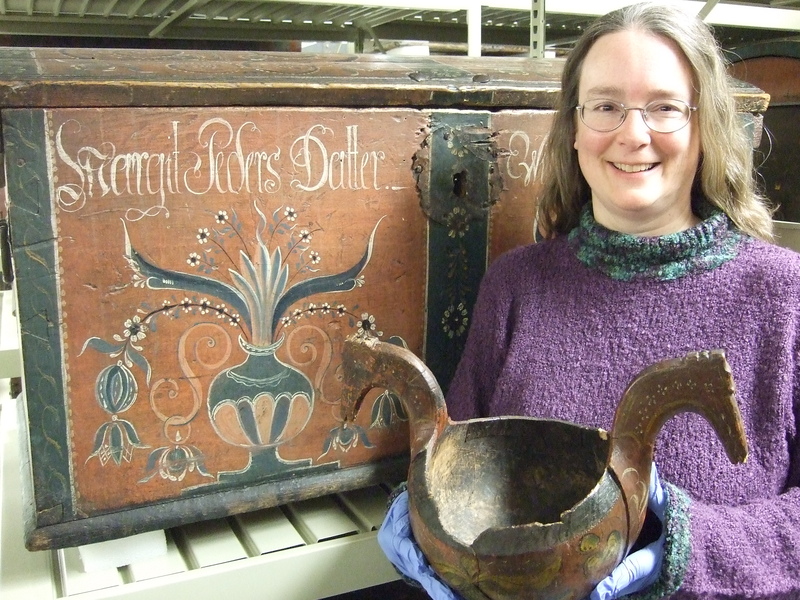 A museum curator’s job includes studying, preserving, and interpreting historical objects. 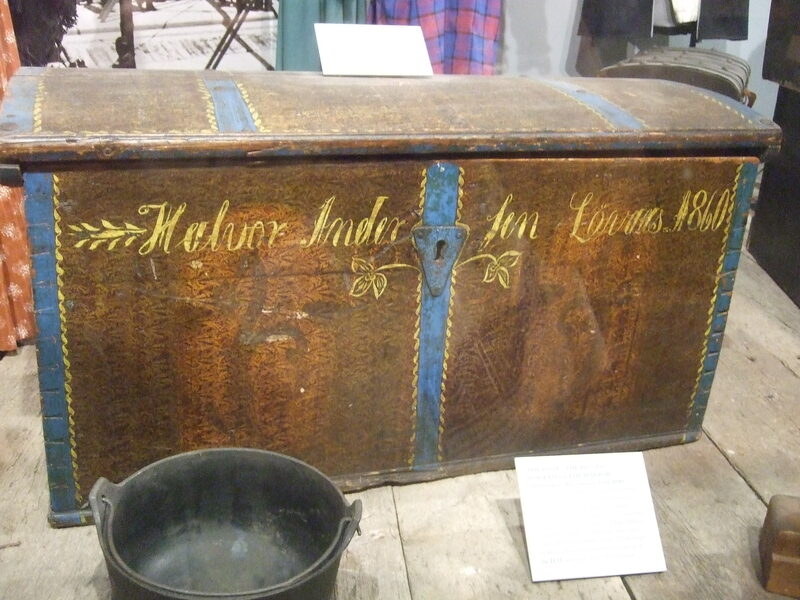 When I worked at Old World Wisconsin I thought a lot about objects immigrants used in their New World homes. As I was writing A Settler’s Year, I thought a lot about the things immigrants chose to carry on their journey. 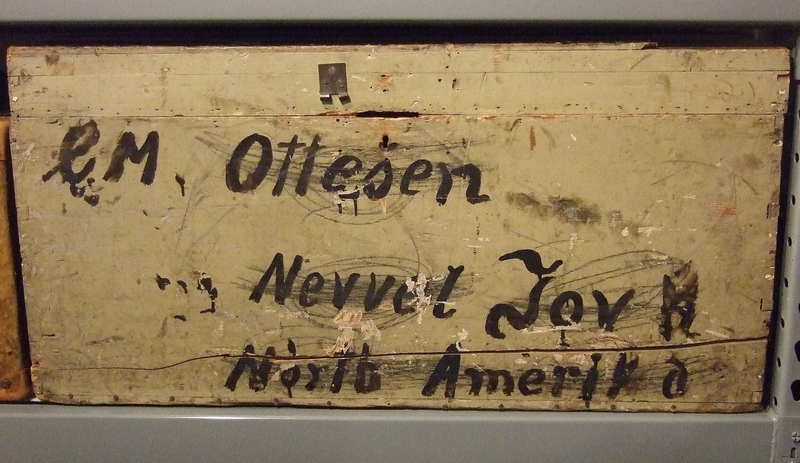 A few years ago I enjoyed a behind-the-scenes tour of some of the artifacts in storage at Vesterheim Norwegian-American Museum in Decorah, Iowa. 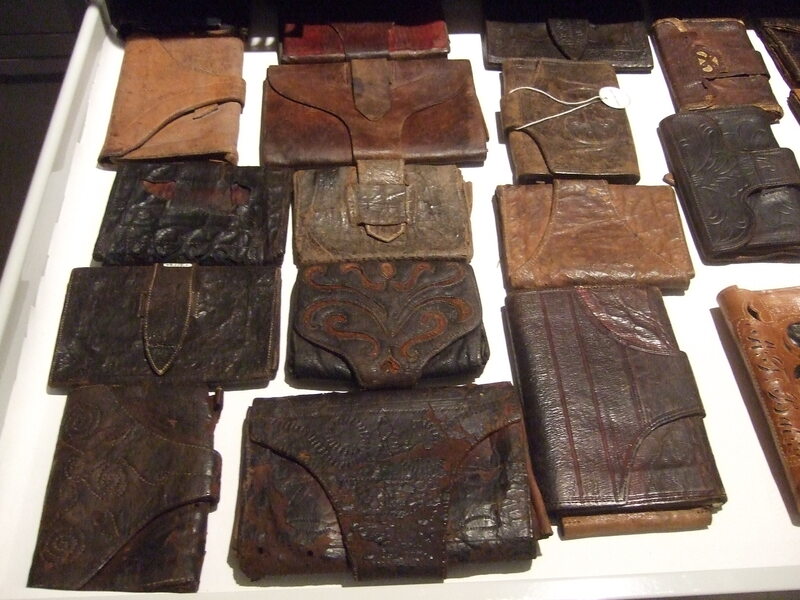 Chief Curator Laurann Gilbertson showed a collection I’d never considered—immigrant wallets. As she talked about them, I realized how important these wallets were for those traveling from Europe. 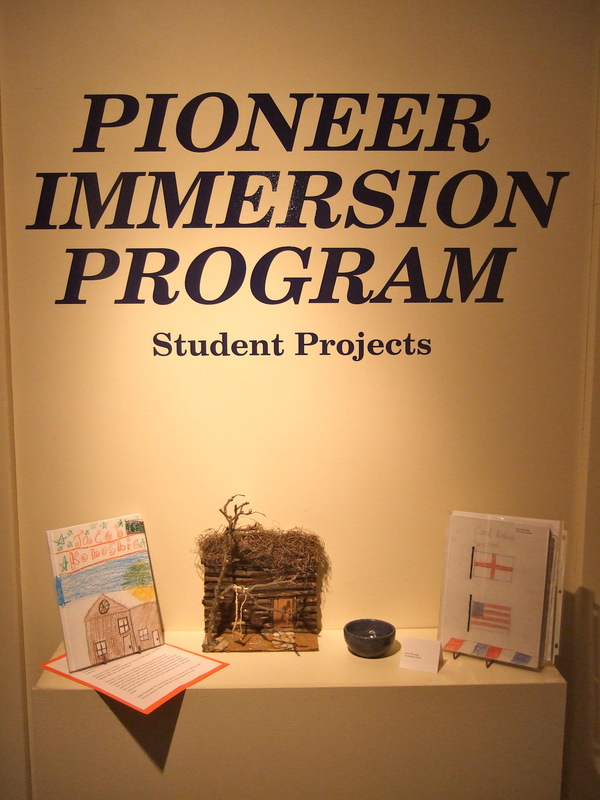 Immigrants painstakingly calculated expenses, and money had to be meted out with care. 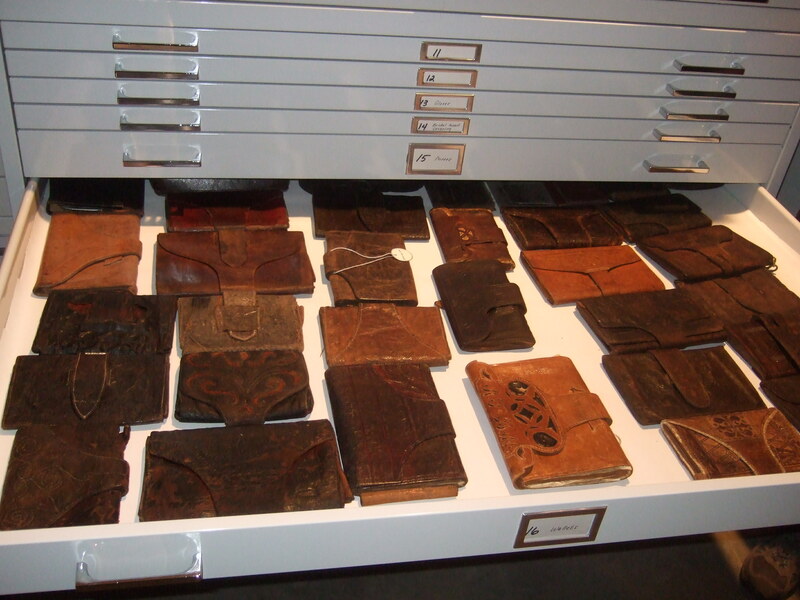 In addition to money, these wallets often held precious papers. 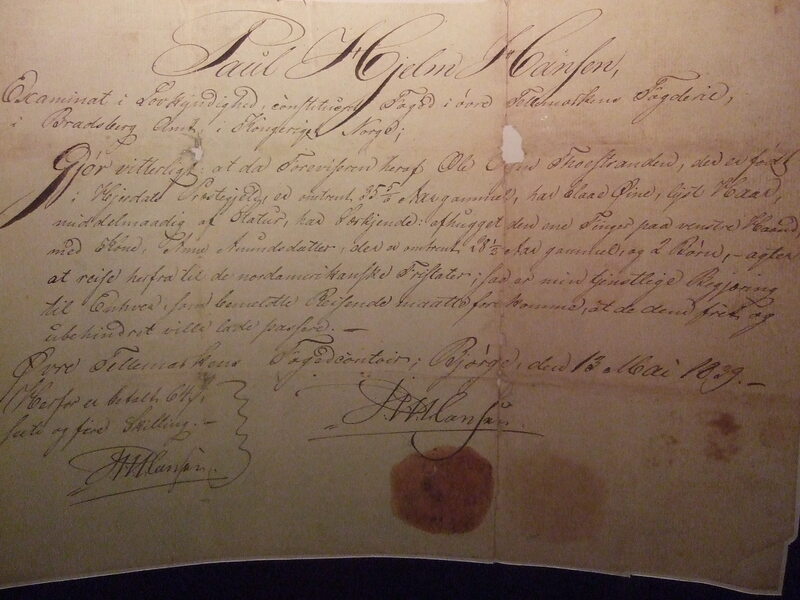 According to a museum exhibit, these papers might include a “passport” giving a traveler permission to leave, a statement from the local church attesting to his or her good standing, and certificates of vaccination for “cow pox” or other diseases. 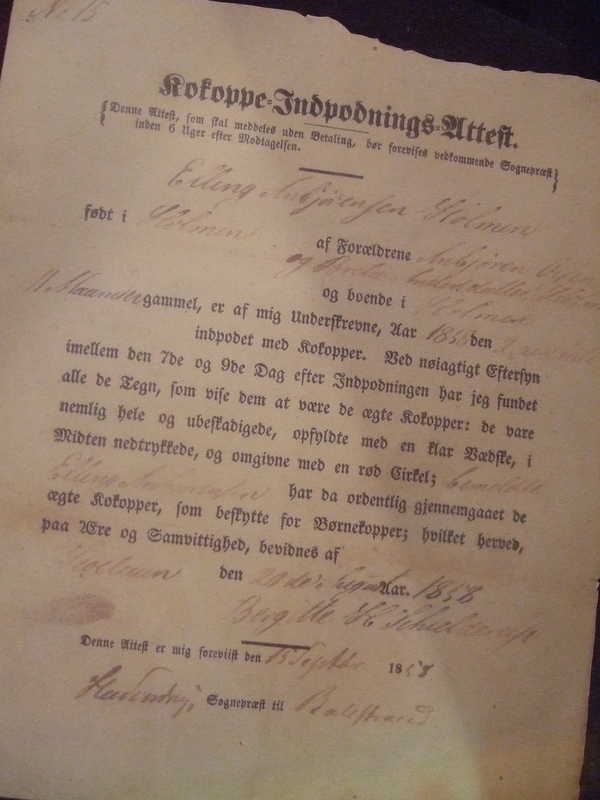 Travel document on display at Vesterheim. 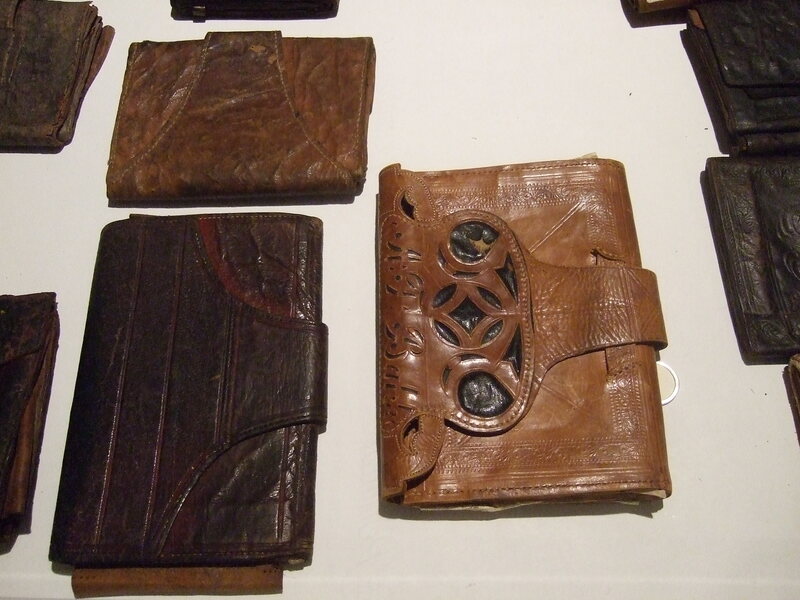 Given the importance of what was to be carried in these wallets, it’s not surprising that some show real craftsmanship. 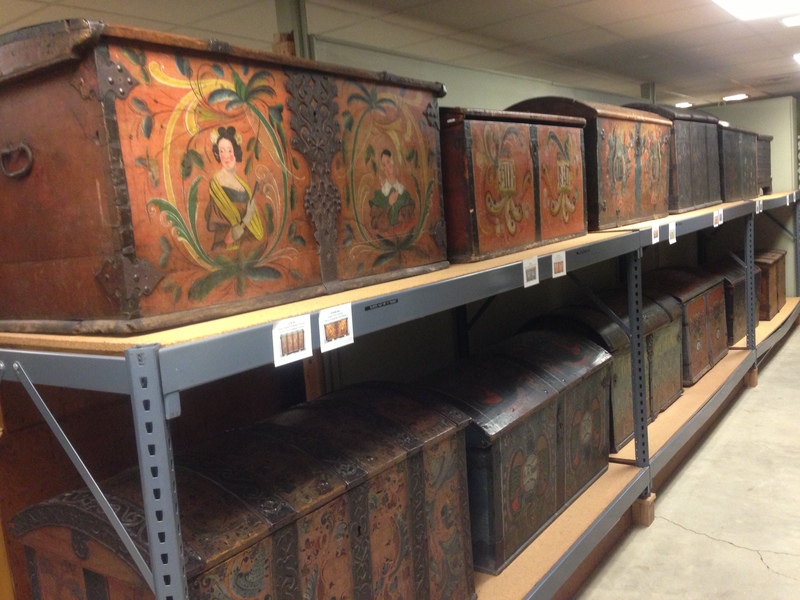 They conjure images of immigrants carefully tucking away their precious documents and money. I imagine men patting their pockets from time to time, reassuring themselves their wallets were still there. I imagine women slipping wallets under their pillows at night for safekeeping. Immigrant literature includes many tales of theft, or swindlers waiting in every port to take advantage of newcomers. 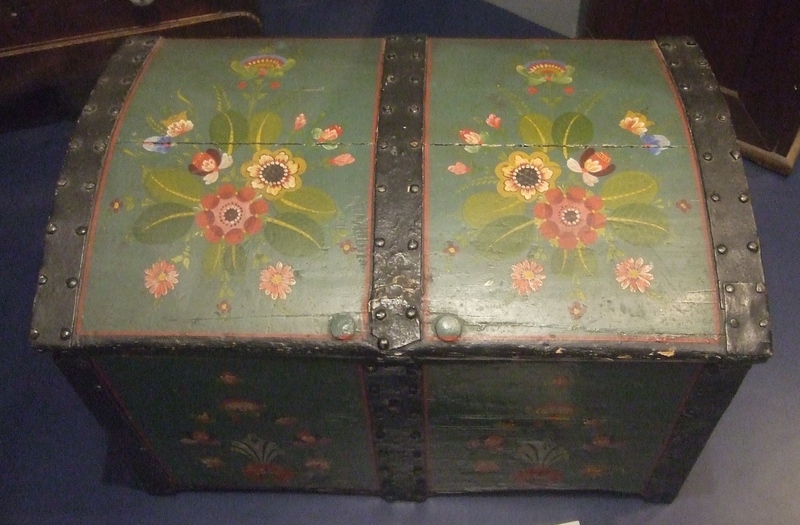 But with good planning and some luck, the wallets and their contents would see the immigrants safely to their new homes. 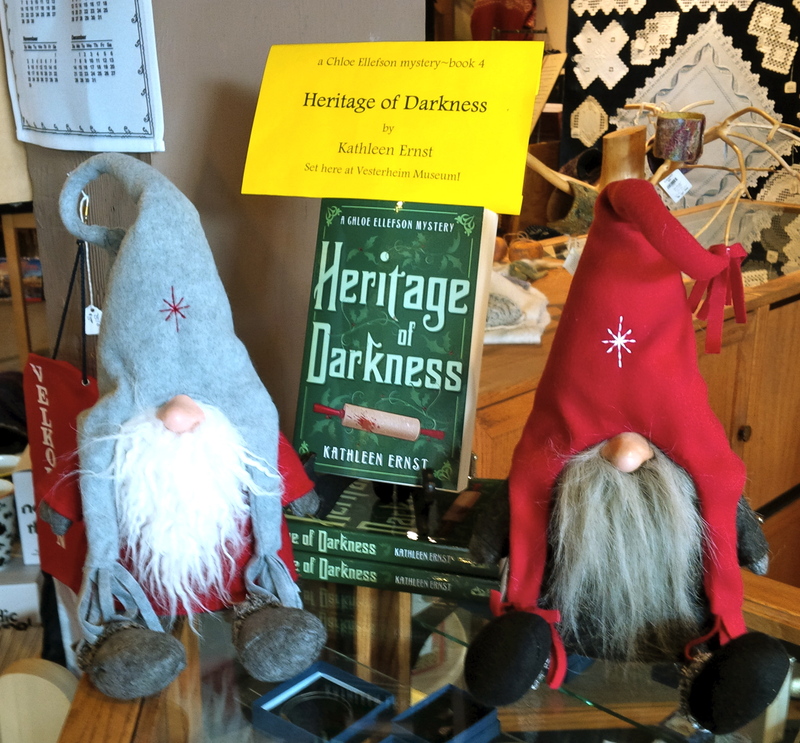 I knew Roelke McKenna needed to accompany Chloe and Mom to Decorah in Heritage of Darkness. Signing him up for a woodworking class wasn’t hard, either; I’d already established in an earlier book that he enjoying carving. The question was: what style of carving should he pursue? 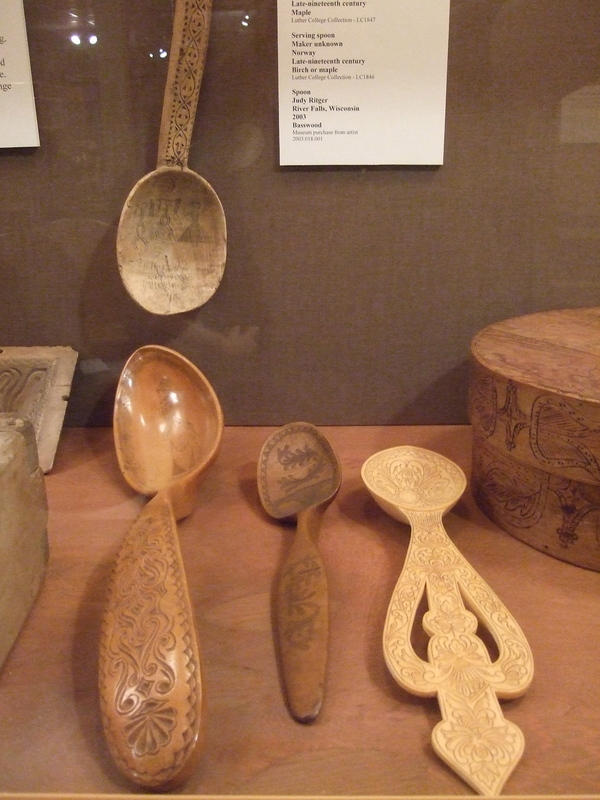 Vesterheim Norwegian-American Museum’s collection includes exquisite pieces of different styles. 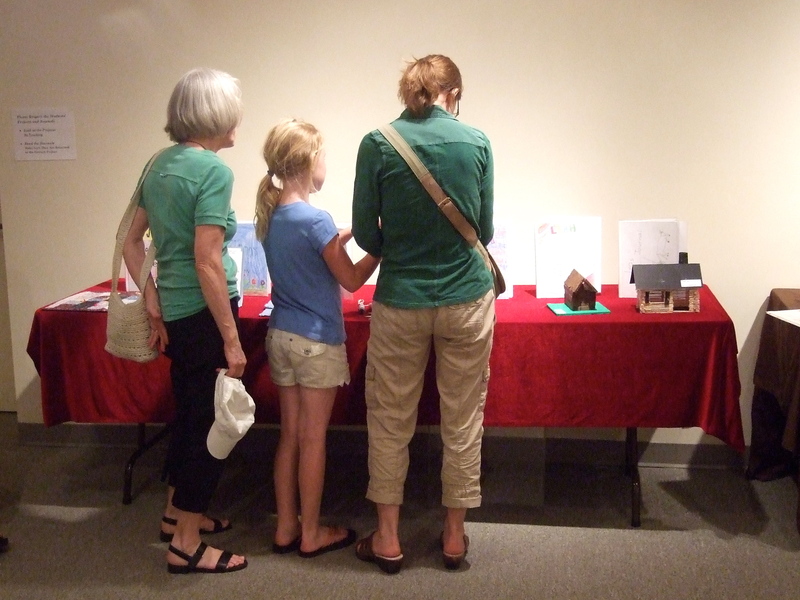 The museum’s workshop schedule offers lots of diversity as well. 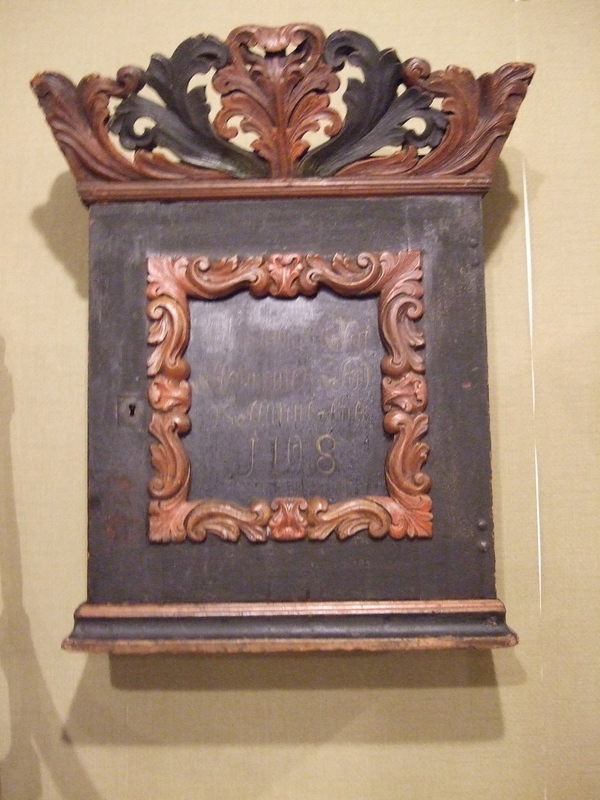 Acanthus carving, featuring ornate and flowing leaf designs, is perhaps the most popular style. Acanthus carving dates back centuries. 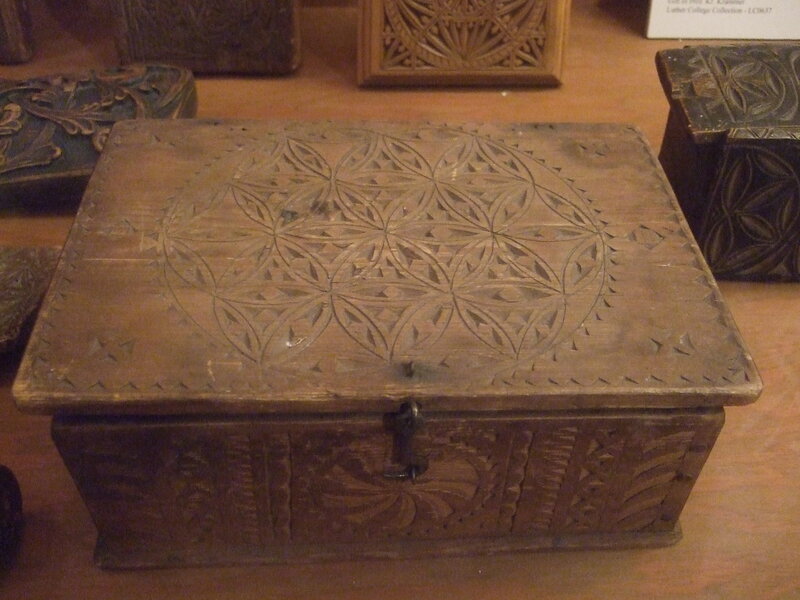 The style of relief carving started in Greece and spread to other area. Which style was right for Roelke? He’s really not a free-flowing kind of guy. He does appreciate precision and order. I decided that chip carving best suited his personality. 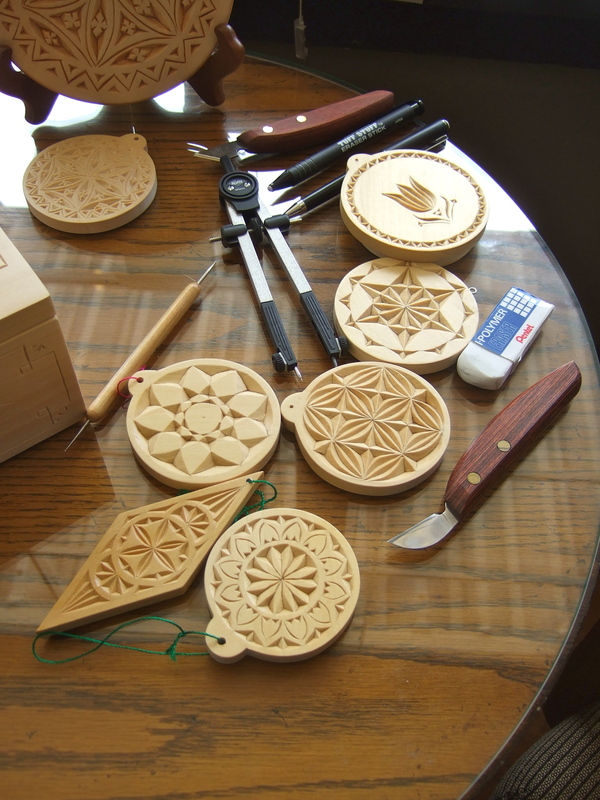 I turned to Vesterheim’s chip carving instructor, Ellen Macdonald, for help. She helped me understand the basics of chip carving. We also talked about what Roelke would have experienced in a week-long class. 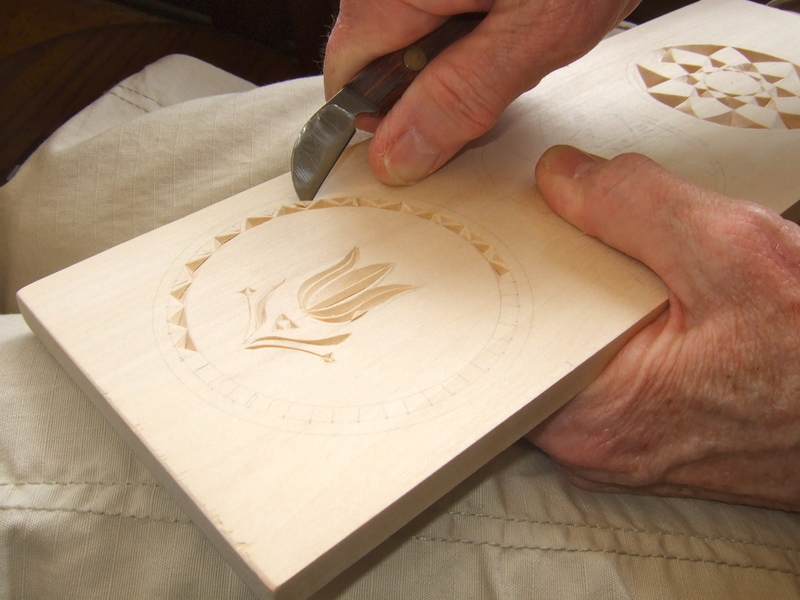 One of the things many carvers like about this style is that is requires only simple tools, and is very portable. Ellen’s work is gorgeous. 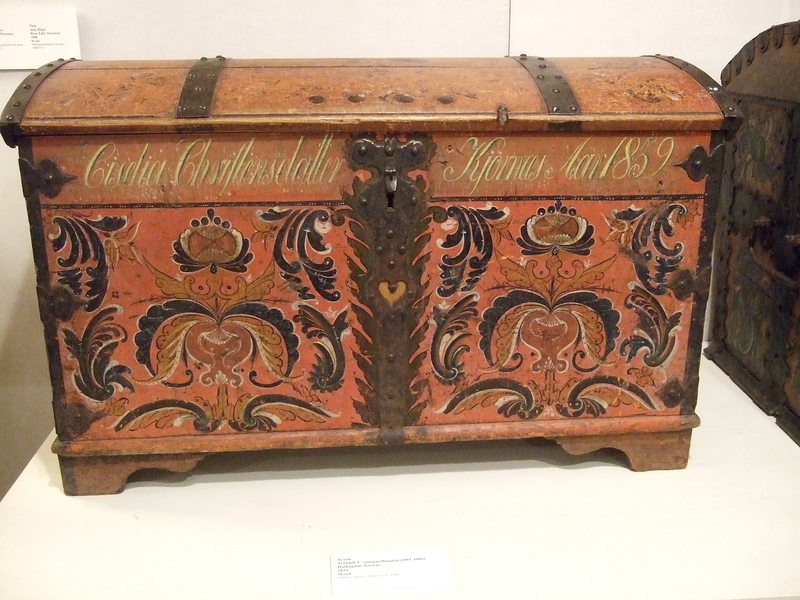 It was easy to imagine Roelke aspiring to such craftsmanship. Roelke ran a finger over his work. Geometry…maybe that was it. His cousin Libby had called him “rigid” more than once. 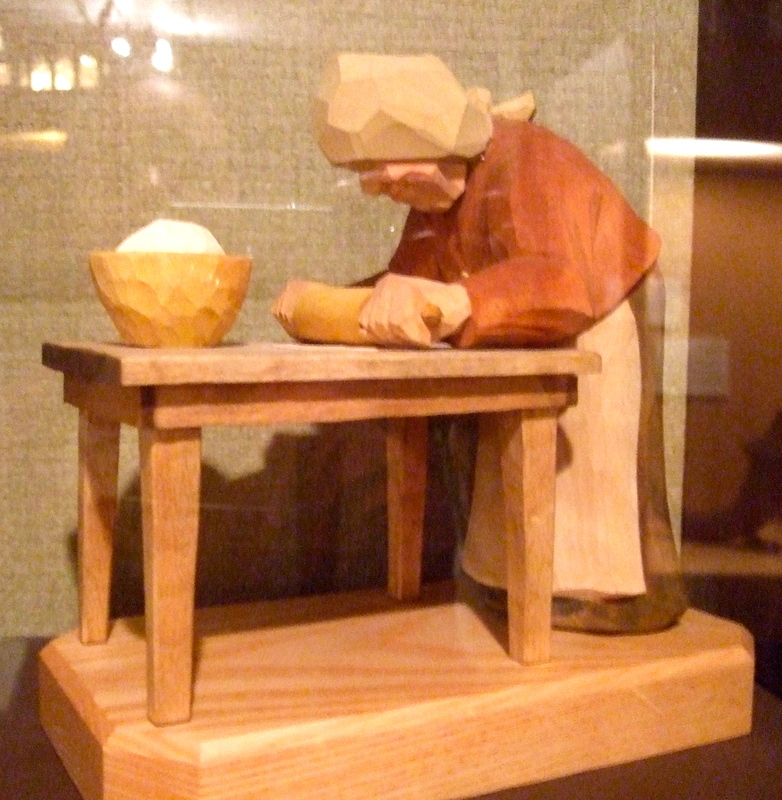 He preferred “meticulous.” Either way, the precision of chip carving appealed to him. 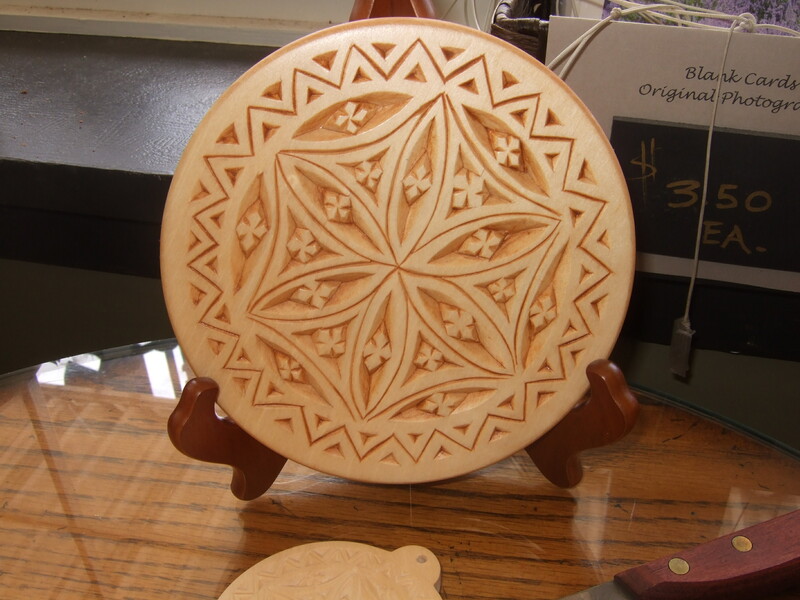 …He wanted to learn how to design and carve rosettes. He wanted to design and carve rosettes with, as his classmate Lavinia had observed earlier, stunning energy and symmetry. And maybe, if Chloe played her cards right, he’d carve something special just for her. 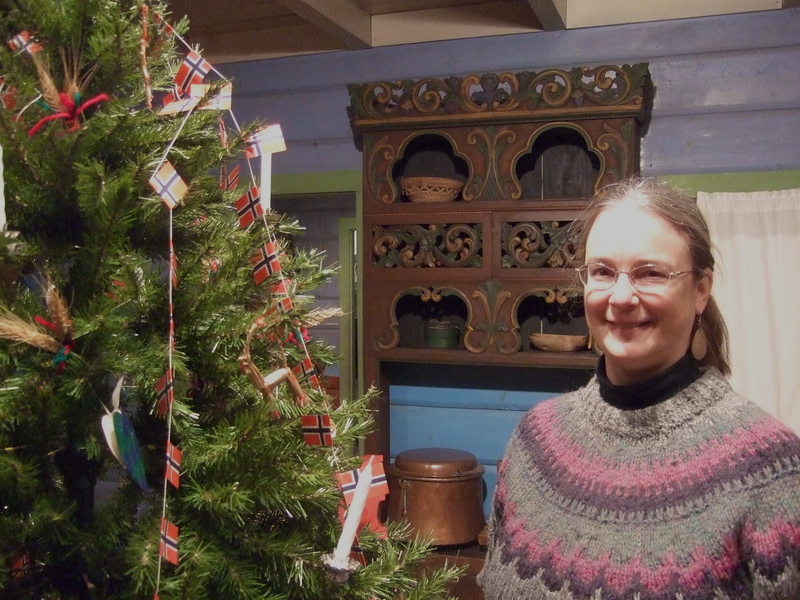 Vesterheim is open year-round, so you can visit anytime and tour the exhibits. 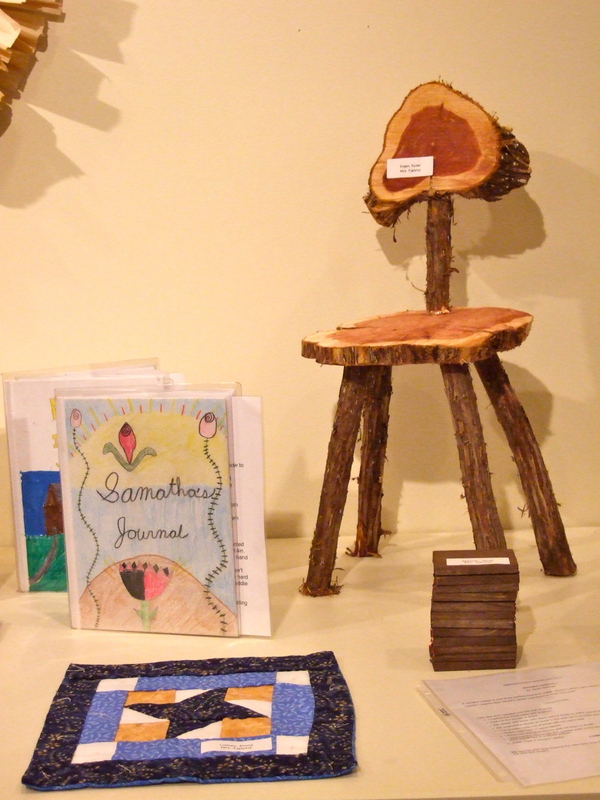 Click HERE if you’d like more information about the museum’s folk-art classes. 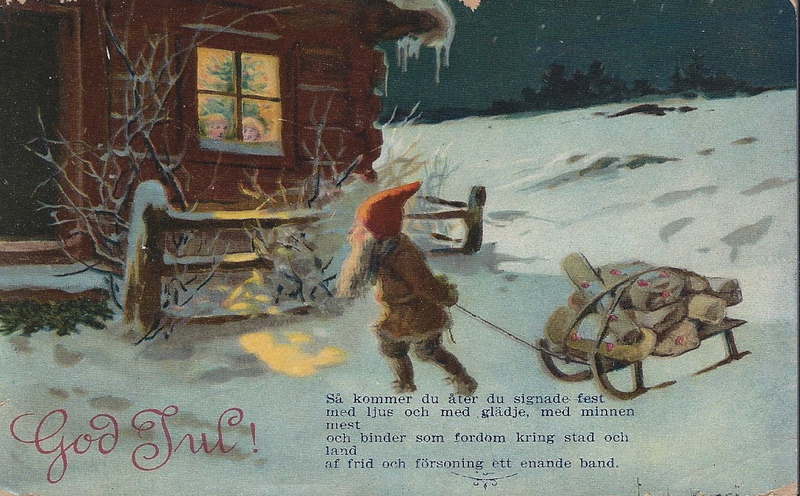 In honor of Christmas eve, let’s set aside the ancient, spooky traditions featured in Heritage of Darkness, and celebrate one of Norway’s more recent (and fun) bits of folklore: the nisse. 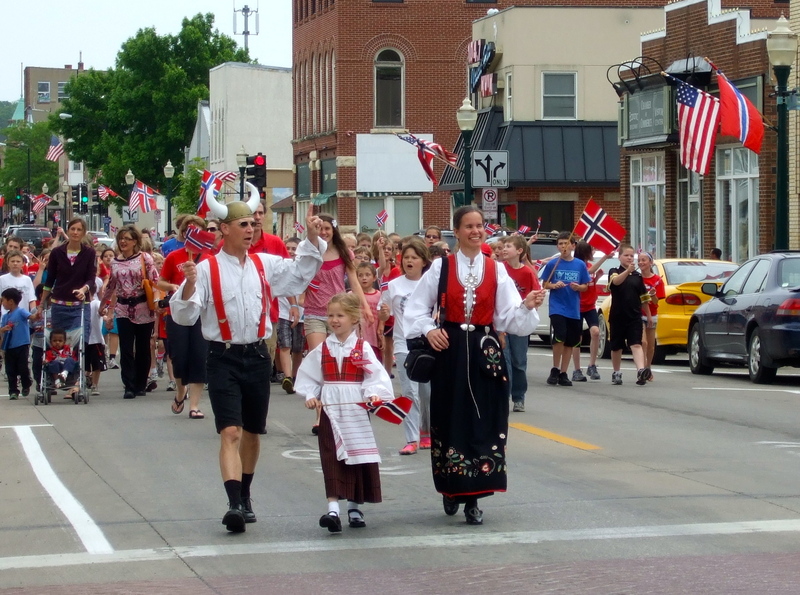 Nisser are household or farm spirits. Belief in these mythological creatures, which resemble garden gnomes, became common in Scandinavia in the late eighteenth century. 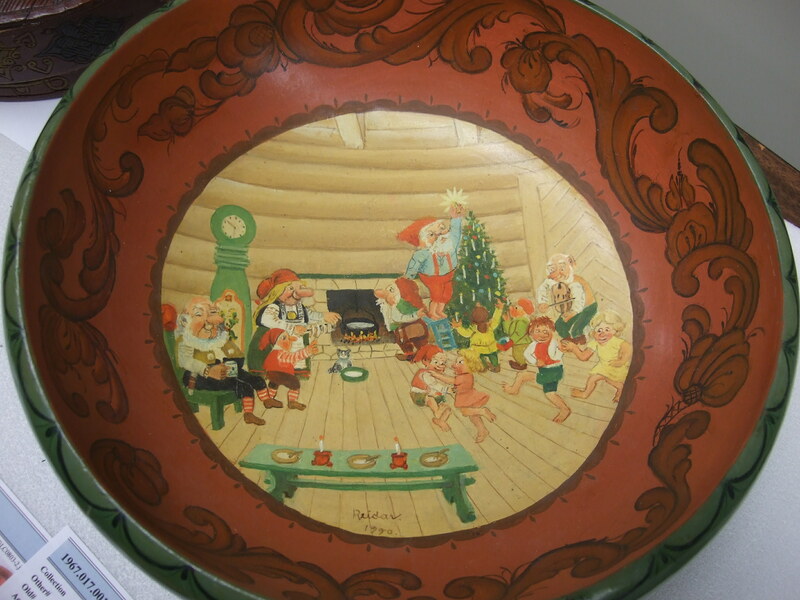 That being the case, farm families were careful to acknowledge their nisse with a bowl of porridge with butter on Christmas eve. If they forgot, trouble was sure to follow! One common story tells of a young girl who ate the porridge herself. 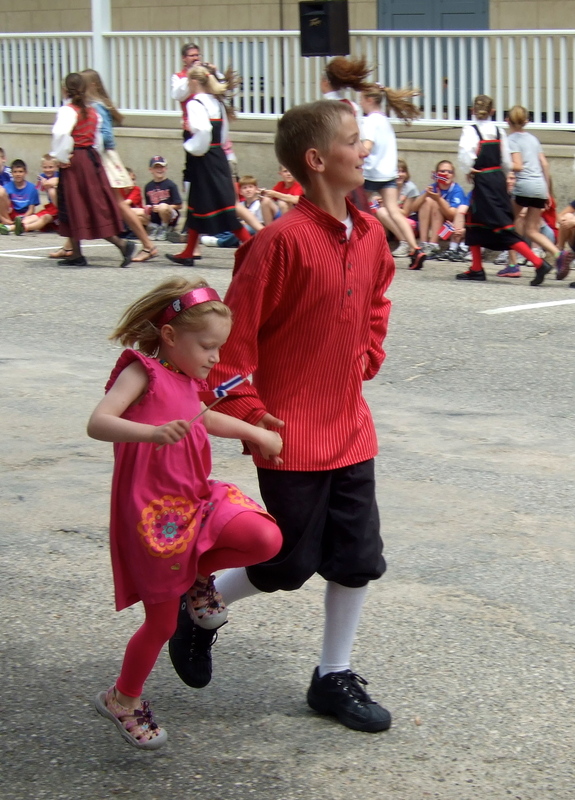 The nisse was so angry he forced her to dance until she almost died. Nisser were also mischievious. A bored nisse might amuse himself by tying the tails of two cows together. 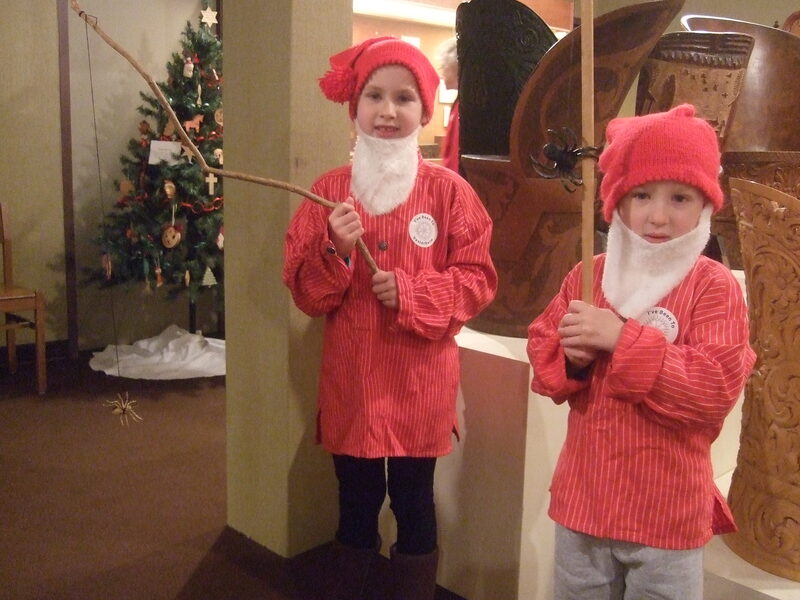 This nisse, on exhibit at Vesterheim Norwegian-American Museum, is trying to startle visitors with his dangling spider. 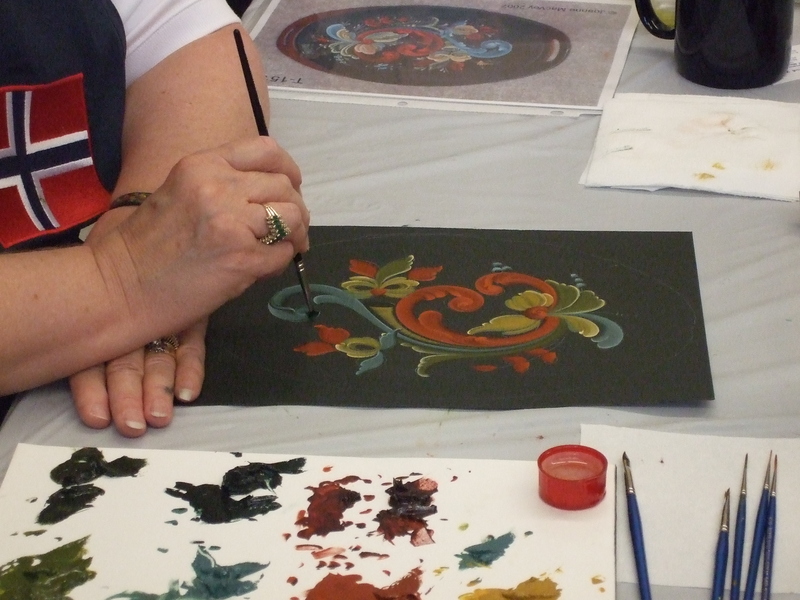 In Heritage of Darkness, one of the projects in Chloe’s rosemaling class is a bowl decorated with nisser—a project inspired by this bowl from Vesterheim’s collection. 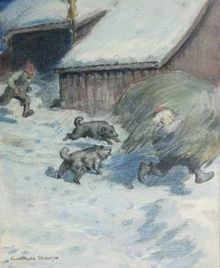 Nisser remain part of Christmas celebrations in many Scandinavian households and communities. 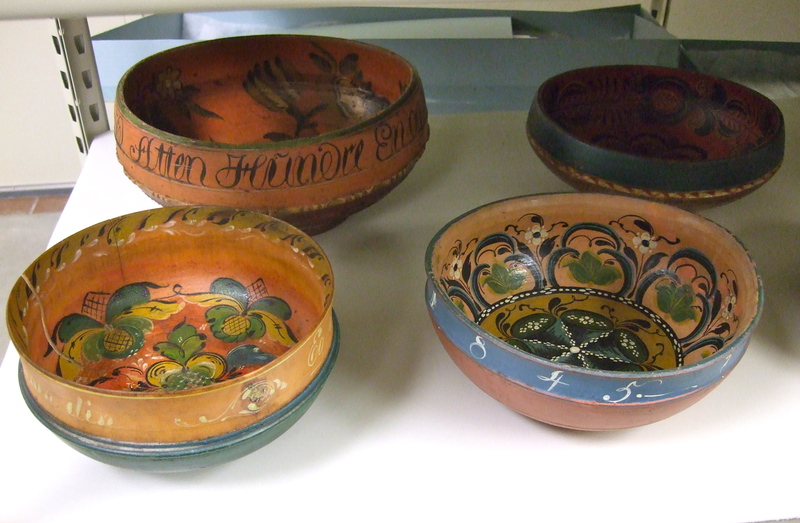 Who knows—if you set out a bowl of porridge tonight, you just might ensure good luck in the coming year! I wish you all a most peaceful and lovely holiday season. 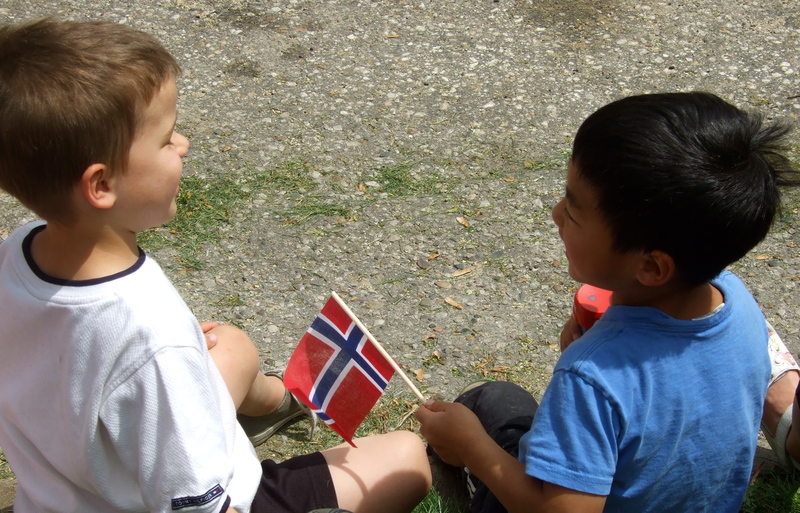 In recent posts I provided a brief glimpse of the history of nålbinding, and an overview of my class at Vesterheim Norwegian-American Museum. I left Iowa knowing that I needed to practice the stitch until it was firmly imbedded in my brain. 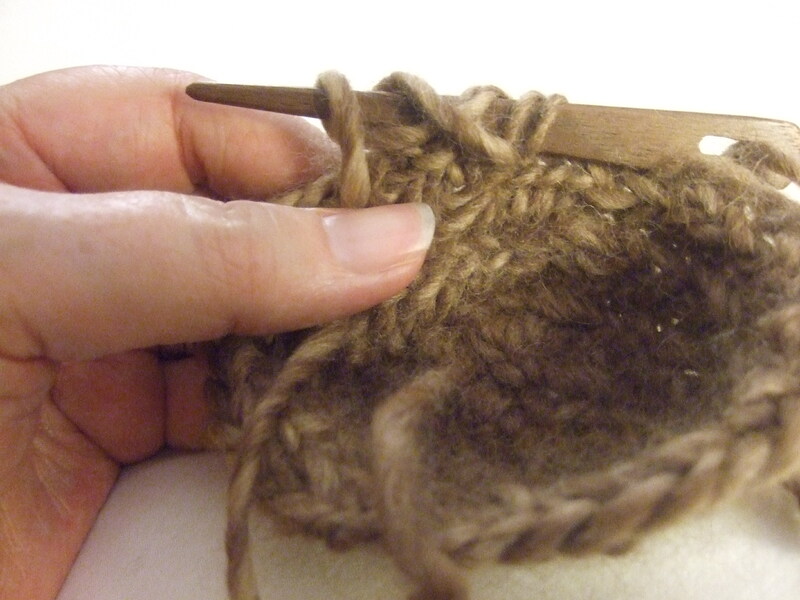 This shows the basic stitch on the needle. I’d decided that my first independent project would be a pair of mittens. 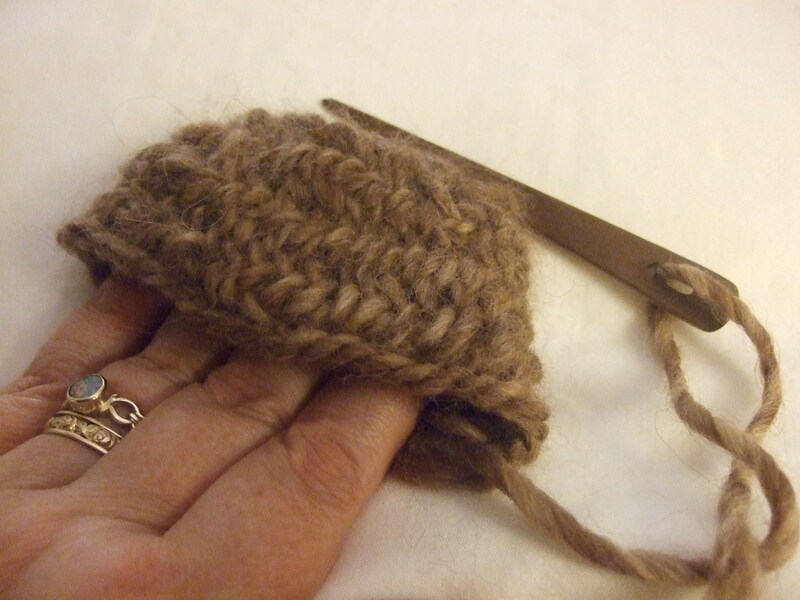 I understood what I needed to do to shape a mitten, so I got started. I got this far in class. Once home, though, I soon discovered that I didn’t want to work on something that required even simple shaping. Life was crazy-busy. I was traveling a lot, and trying to meet deadlines too. 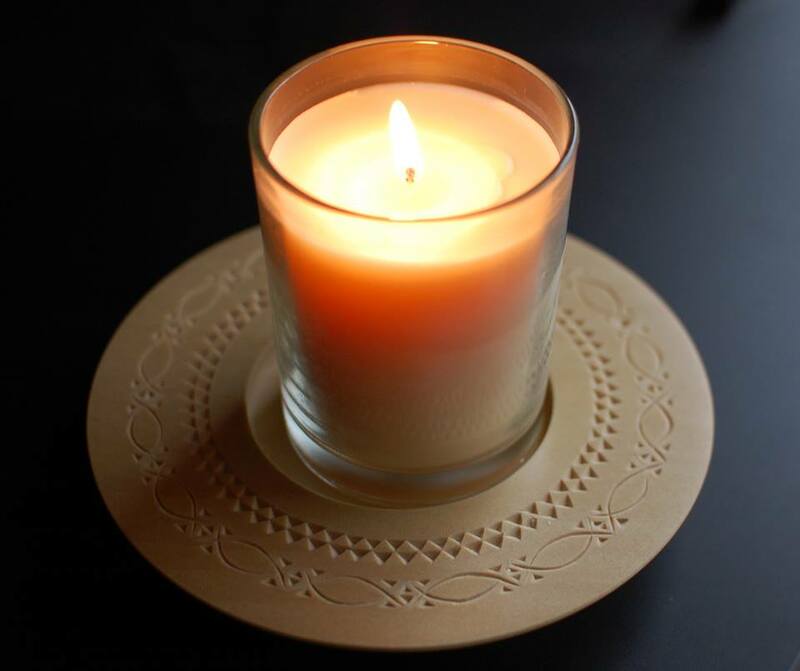 I wanted a handwork project to relax with. So I switched to scarves and bags. 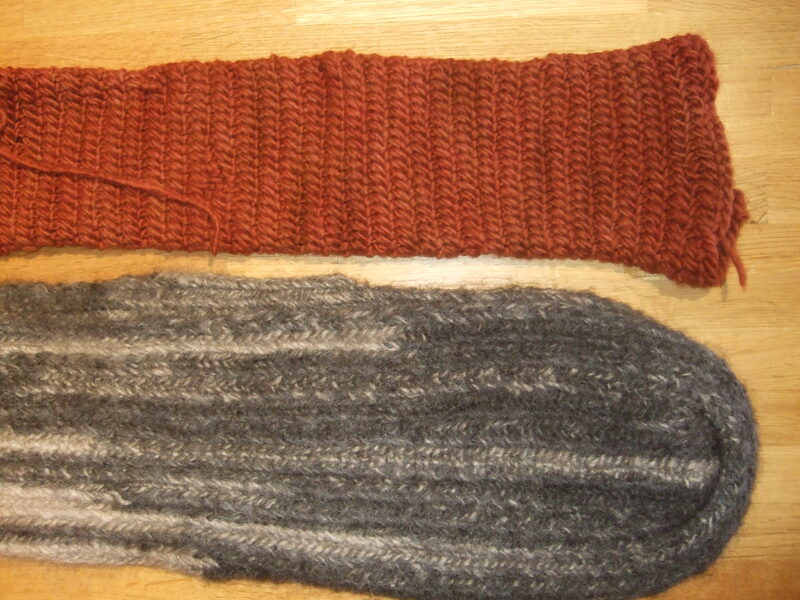 Nålbinding requires natural fibers, and I picked yarns with inherent variations. 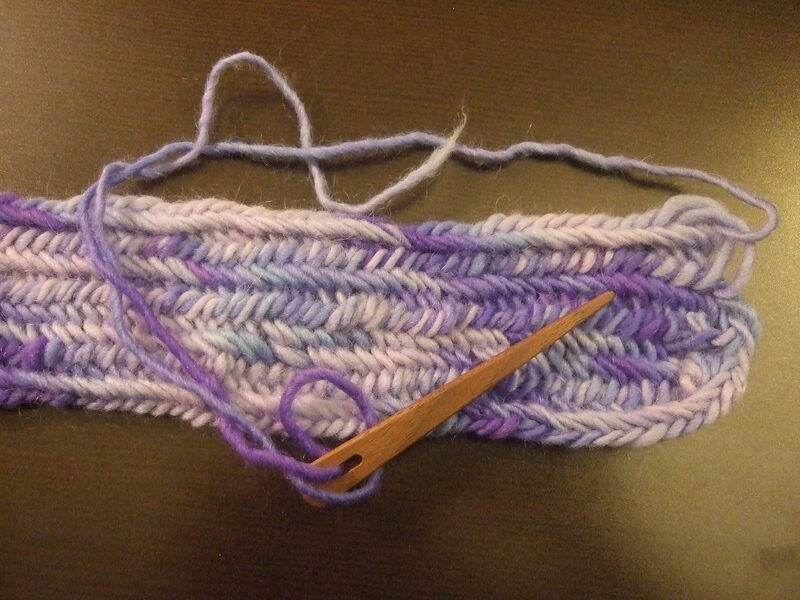 Making a flat bottom for a bag. Unfinished bag, ready for the fulling process. Since taking the class, I’ve learned a lot through trial and error. I’ve learned that when making scarves, it’s tricky to gauge how many stitches to add on the curves so the ends stay perfectly flat. 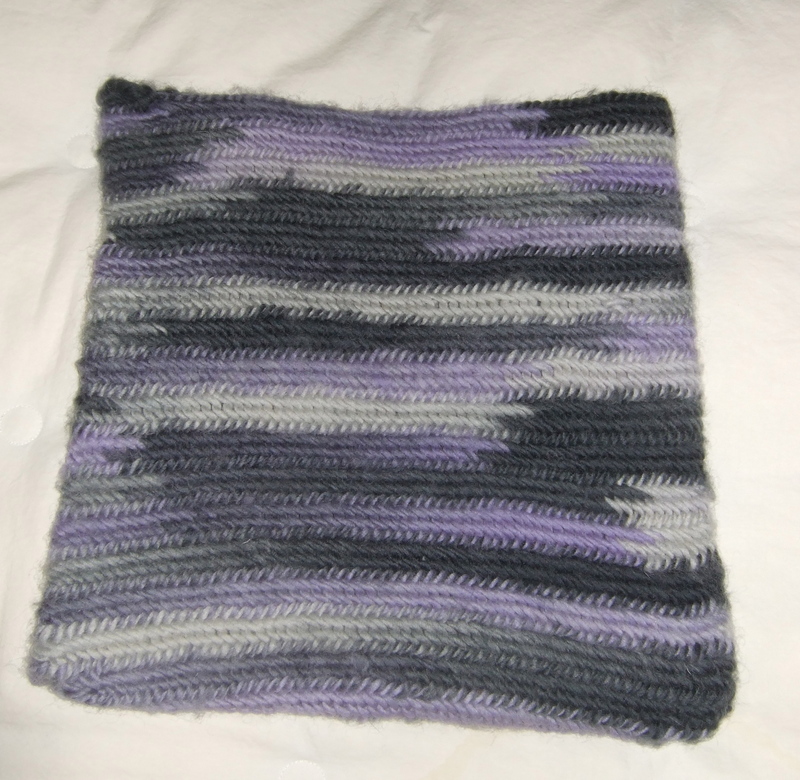 I made the bottom scarf in the round, and even with blocking, the ends aren’t quite flat. My talented friend Becky solved this problem by making a tube instead (top). She’ll close the ends when she’s done and have a double-warm scarf. 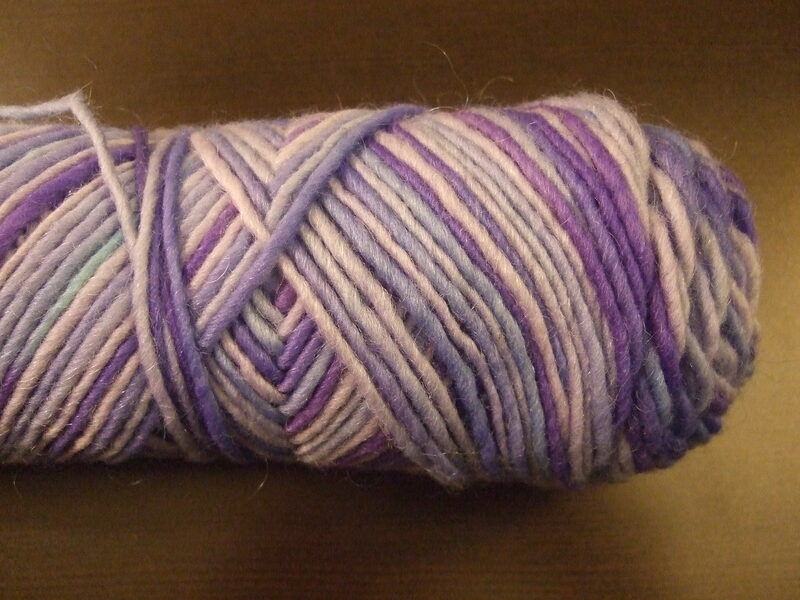 I’ve learned that whatever leads to wool being labeled “washable” makes it difficult to splice yarn or full the finished piece. 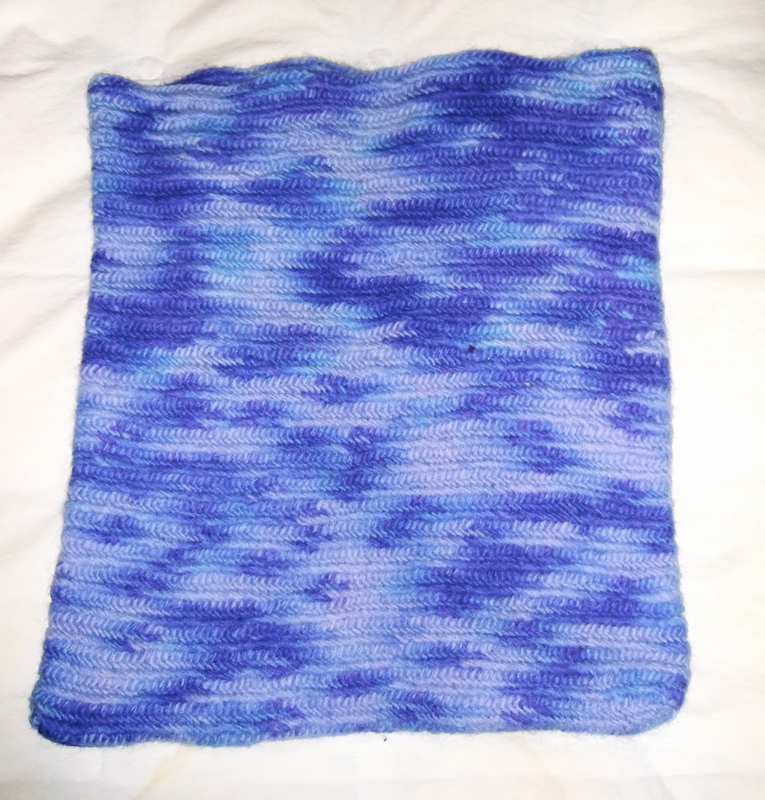 Since this washable wool doesn’t splice or full well, I’ll need to line this bag. I’ve also learned that I never should throw away wool yarn remnants. 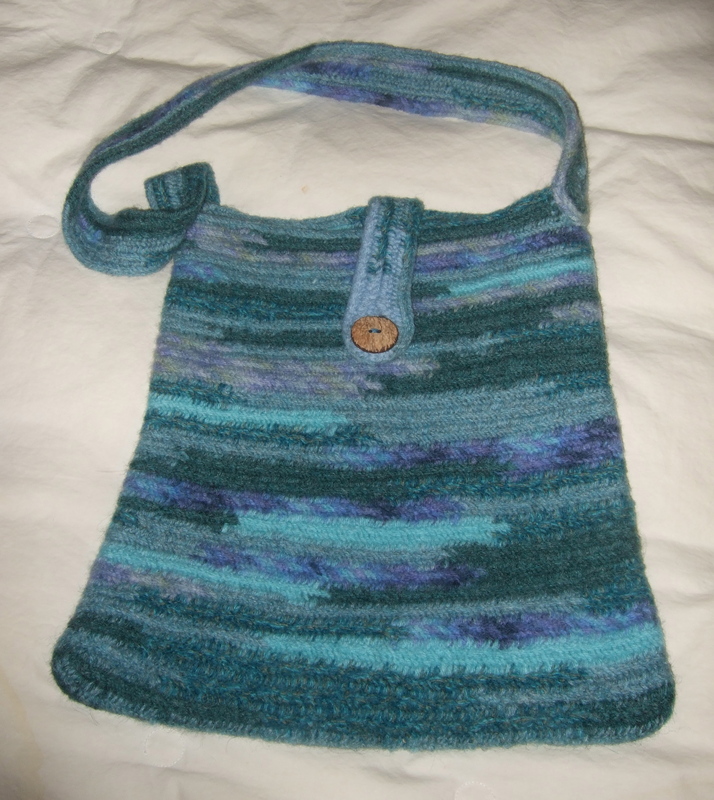 I made this bag from scraps left over from an afghan project. 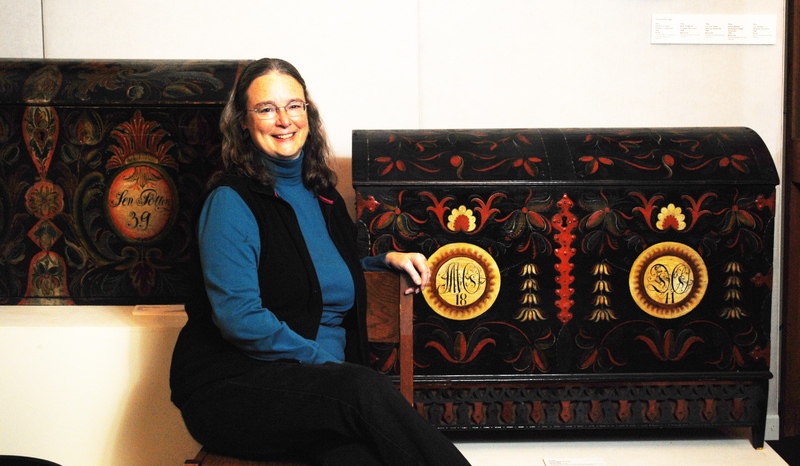 I haven’t given up knitting, hedebo, rosemaling, etc., etc. But I find nålbinding more relaxing than anything else. 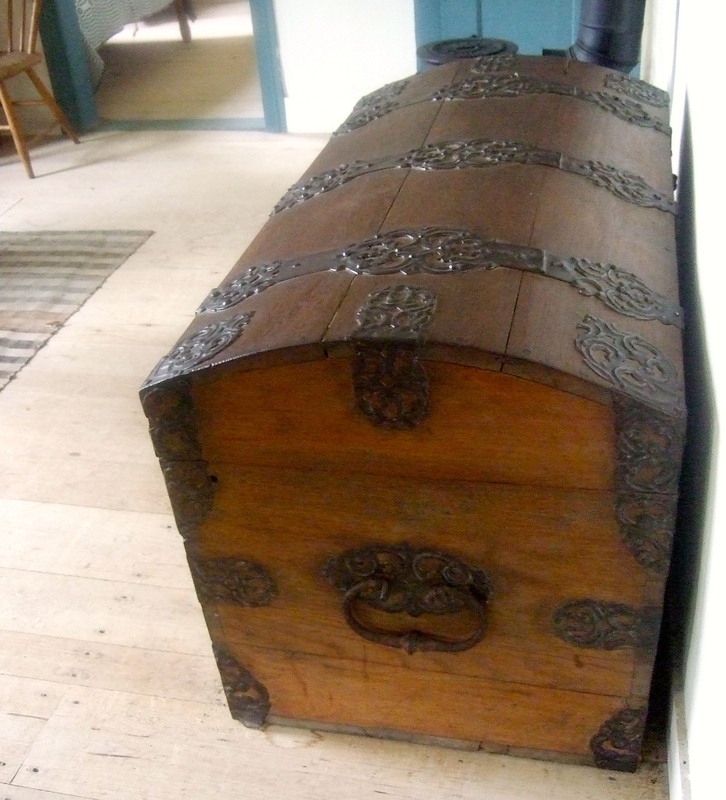 Now I’m trying to figure out when I can introduce nålbinding into one of my Chloe Ellefson Historic Sites mysteries! 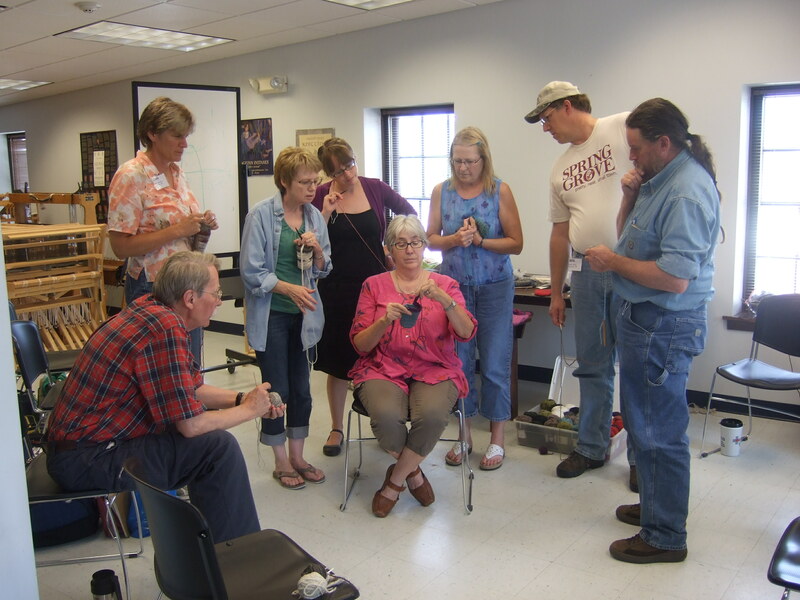 Kate Martinson is offering her nålbinding workshop again this summer. I highly recommend it! 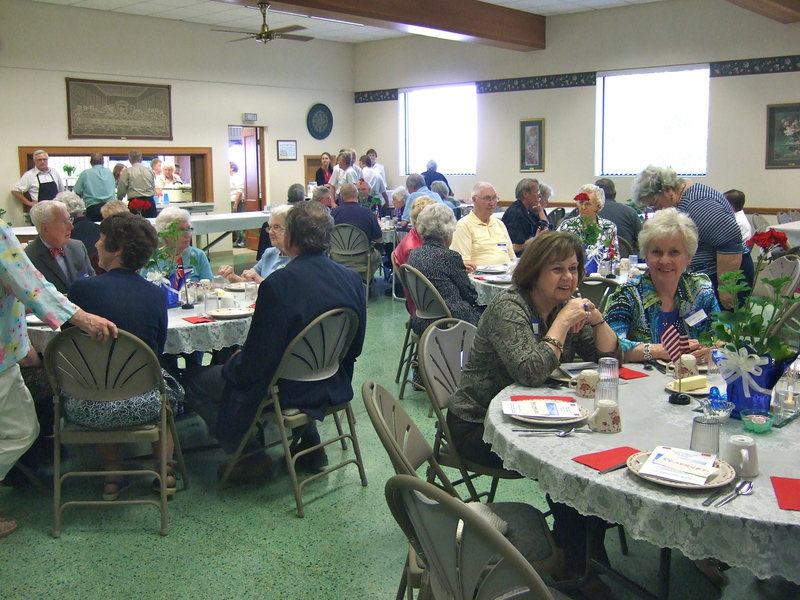 For more information, visit the Vesterheim website. 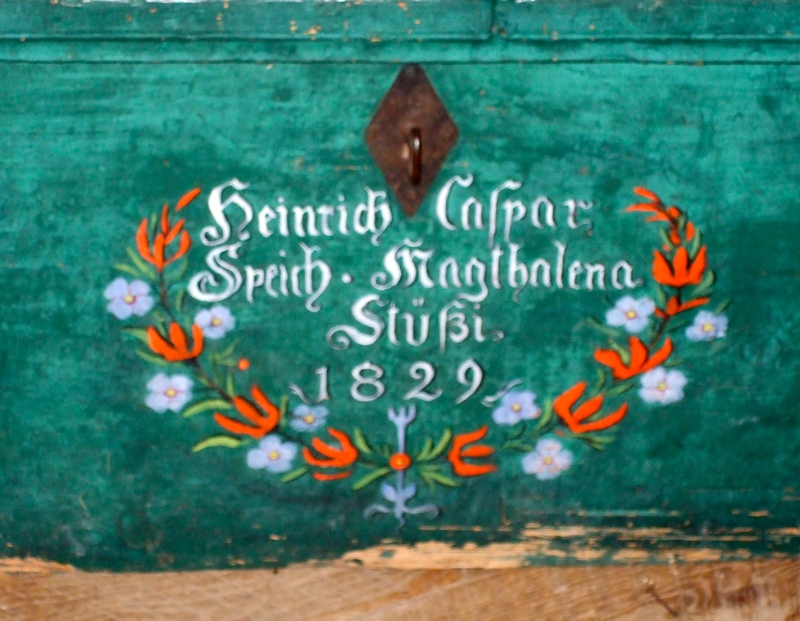 I’m a fiber arts junkie—especially when it comes to old forms of needlework. 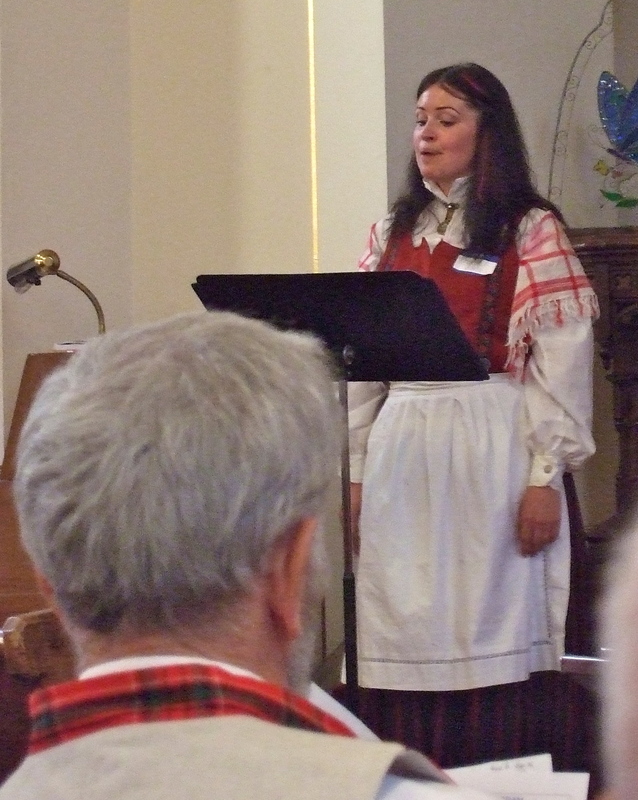 So when I saw a woman demonstrating a technique I didn’t even recognize during a special event at Vesterheim Norwegian-American Museum, I skidded to a halt. 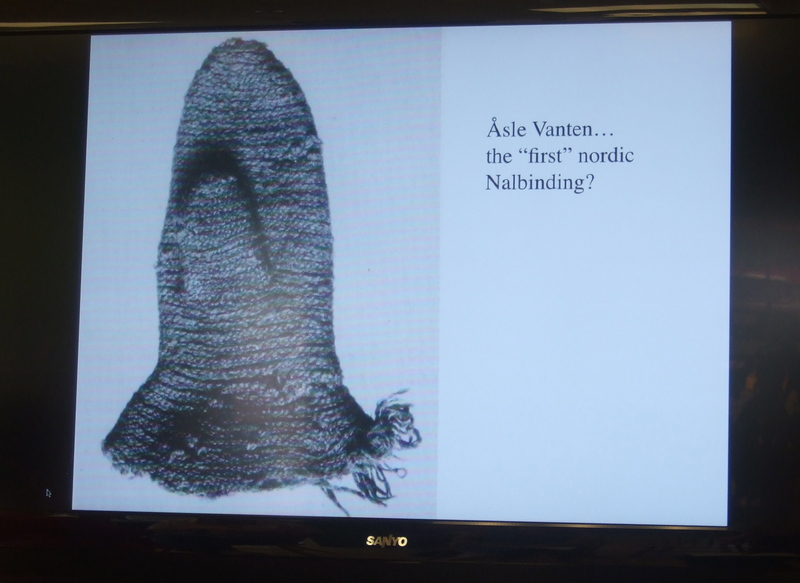 Kate Martinson, Associate Professor of Art at Luther College, explained that she was doing nålbinding (pronounced noll-bin-ding). I immediately signed up for one of her classes. Anthropologists refer to this unique technique as knotless netting. 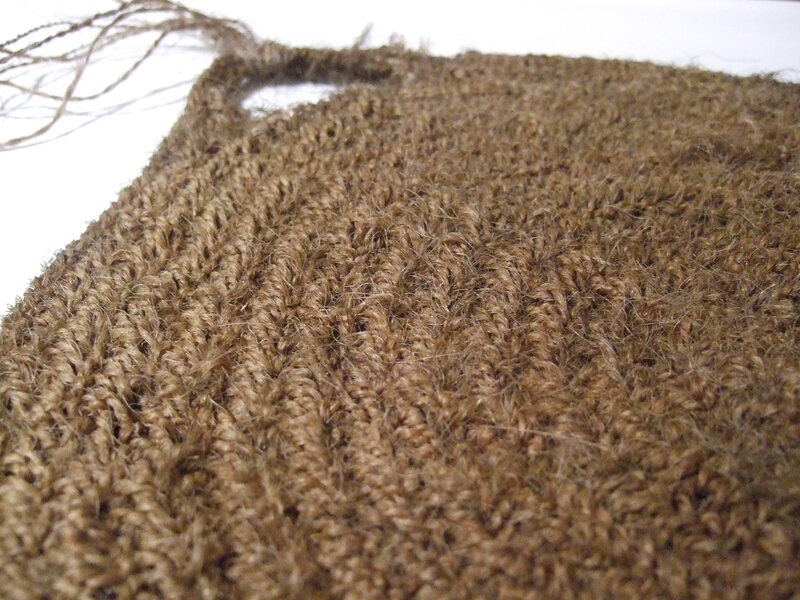 Nålbinding is also sometimes called Viking knitting, but it actually pre-dates the Viking era. 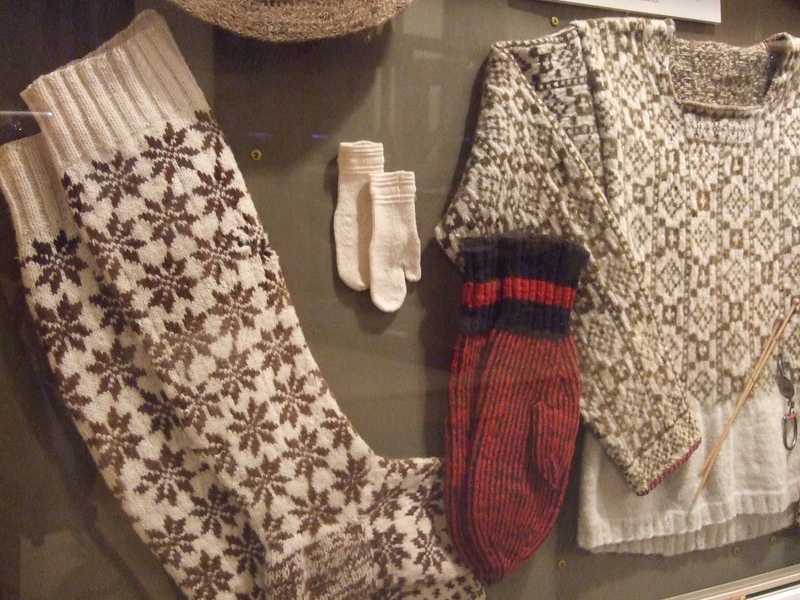 Women have used this technique for centuries to make everything from mittens to strainers to stockings. It produces a very strong and water-repellant fabric that doesn’t ravel when cut. 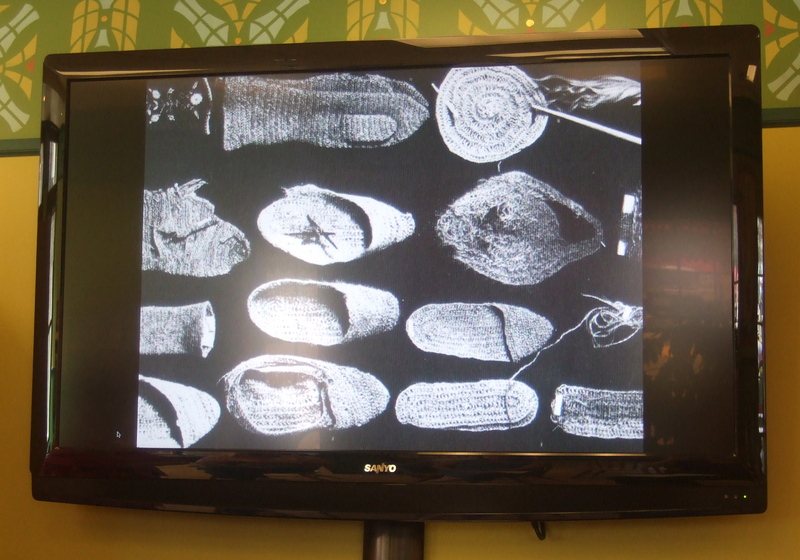 Kate showed us images of artifacts constructed with nålbinding. 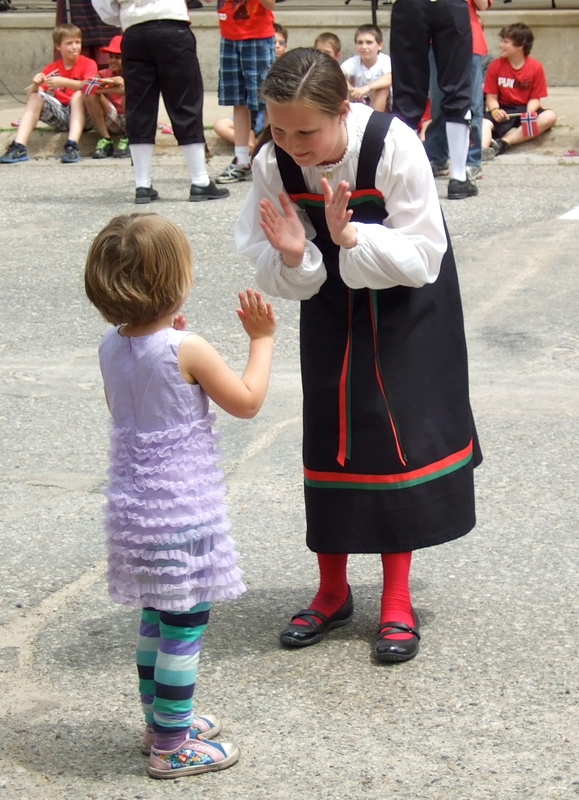 Scandinavian women used fibers from sheep, fox, wolf, bear, and cows. 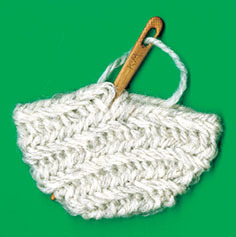 The technique produces a distinctive ribbed finish, but women often fulled the finished item by agitating it in water. 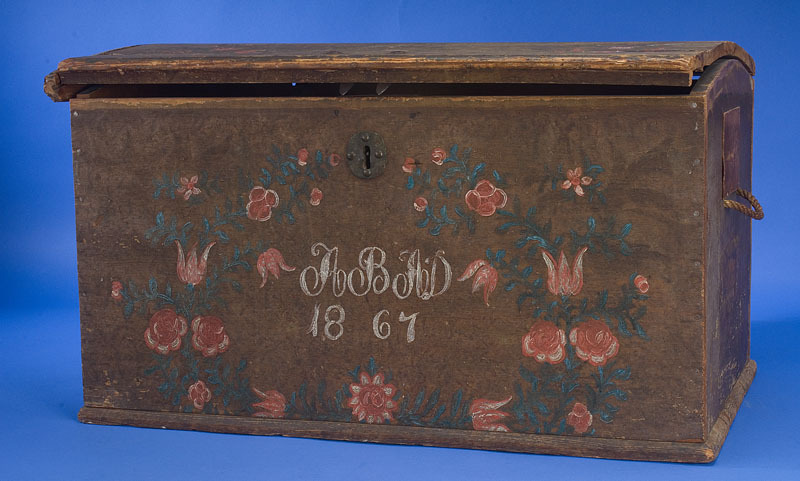 With enough fulling, the stitchwork can totally disappear. 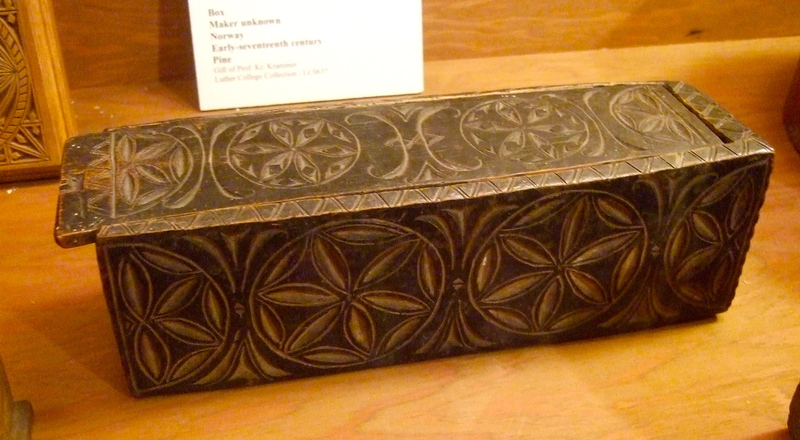 That makes it difficult for even skilled textile historians to know for sure if a certain artifact was made by nålbinding or not. 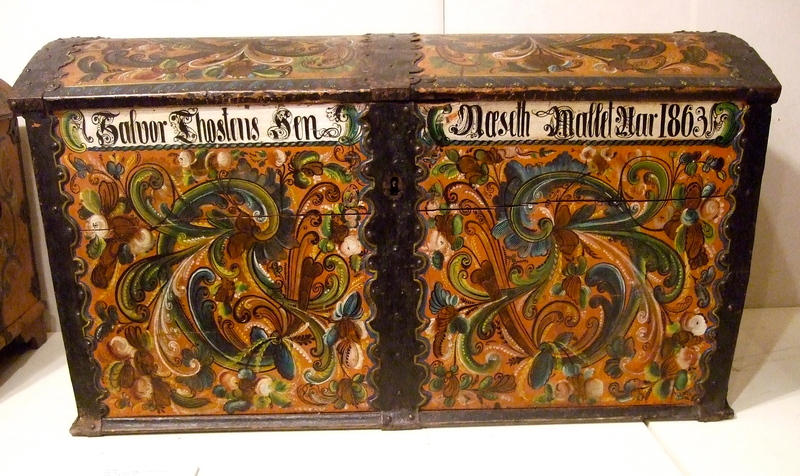 Possibly the oldest known example of nålbinding—maybe as old as 15th-century. 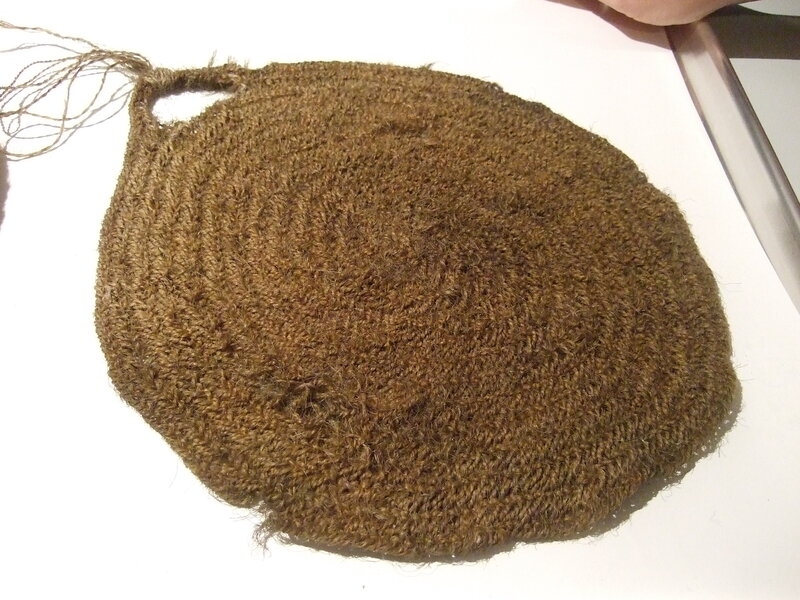 Nålbinding requires only a single-eyed needle and a natural-fiber yarn to work with, so it was quite portable. One cool example: women used this technique when they went to high pastures with their herds of cows each summer. They twisted hairs from their cows’ tail into thread. 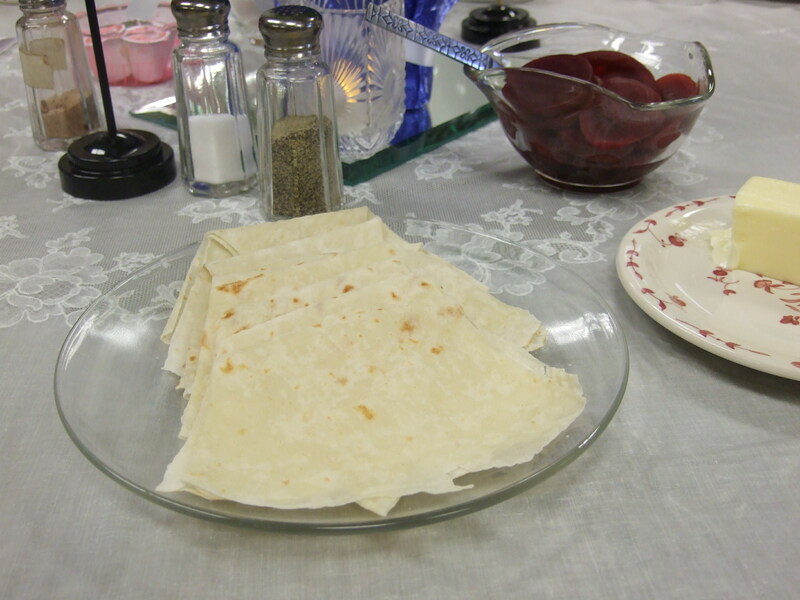 Nålbinding then allowed them to make a perfect mesh for straining milk. 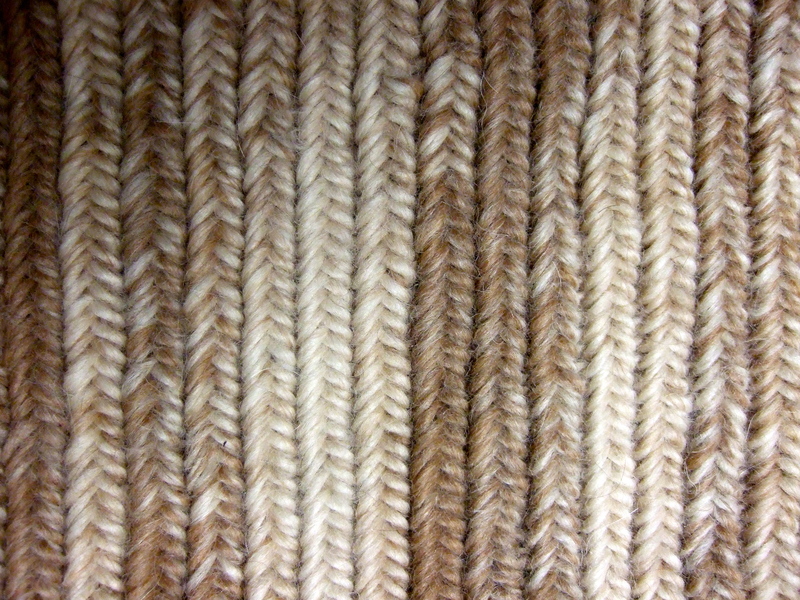 Here you can see the distinctive herringbone pattern in the spiral of stitches. Learning about this provided an unexpected personal connection for me. 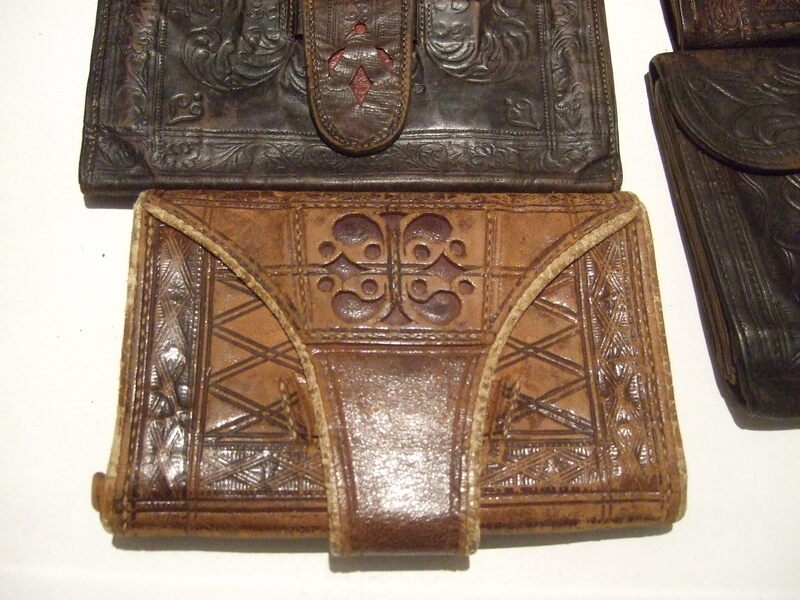 Examples of nålbinding have been found in Iran, China, Peru… the technique was so versatile that it was widely used. 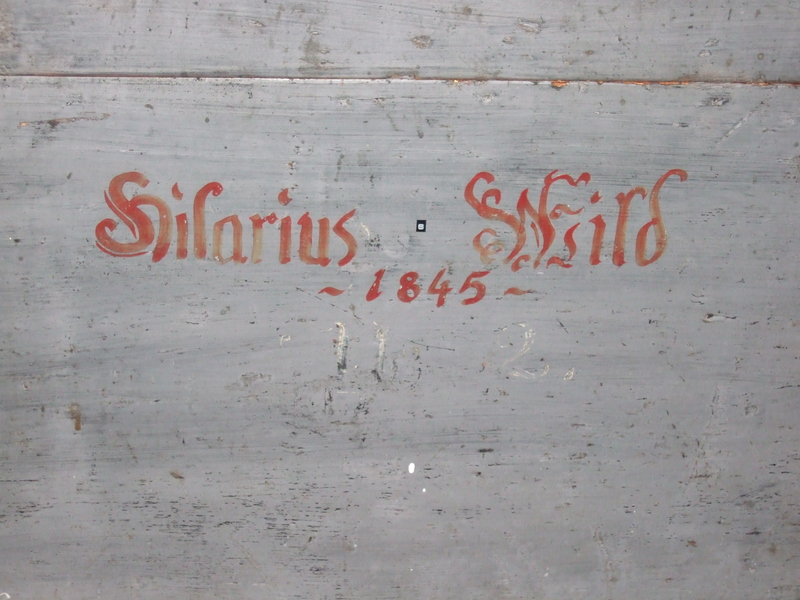 My father’s parents came from Switzerland. 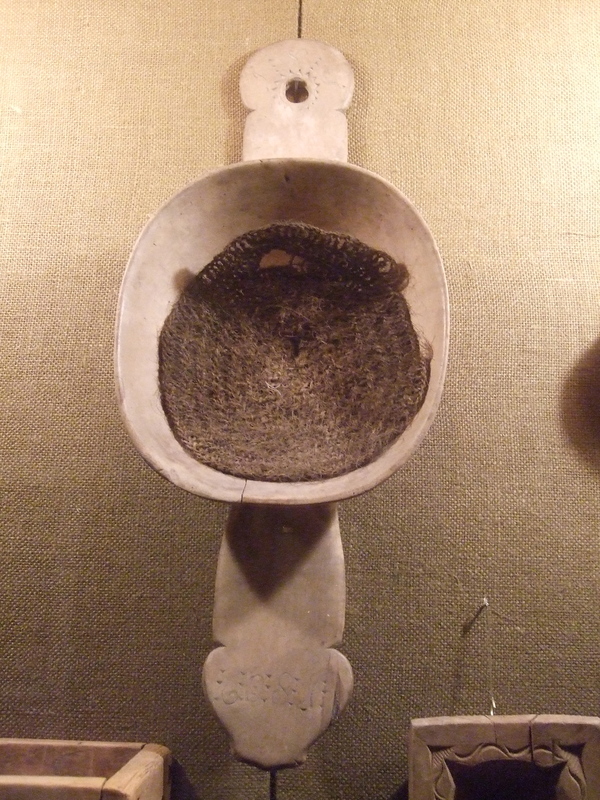 It’s very possible that women on my grandmother’s side of the family made milk strainers just like that when tending their cows in alpine pastures. 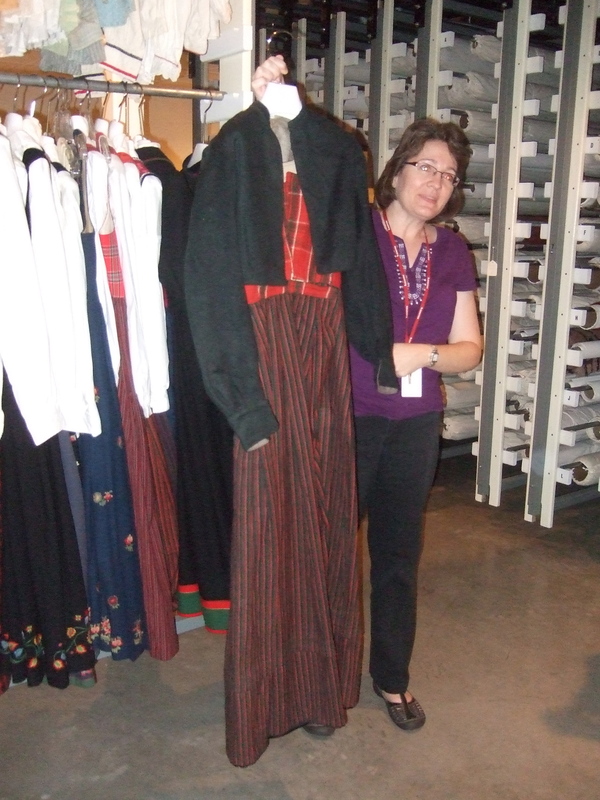 Nålbinding was done in at least some rural areas through World War II; the fabric produced is sturdier than knitted fabric, so when supplies were scarce, women made items this way. 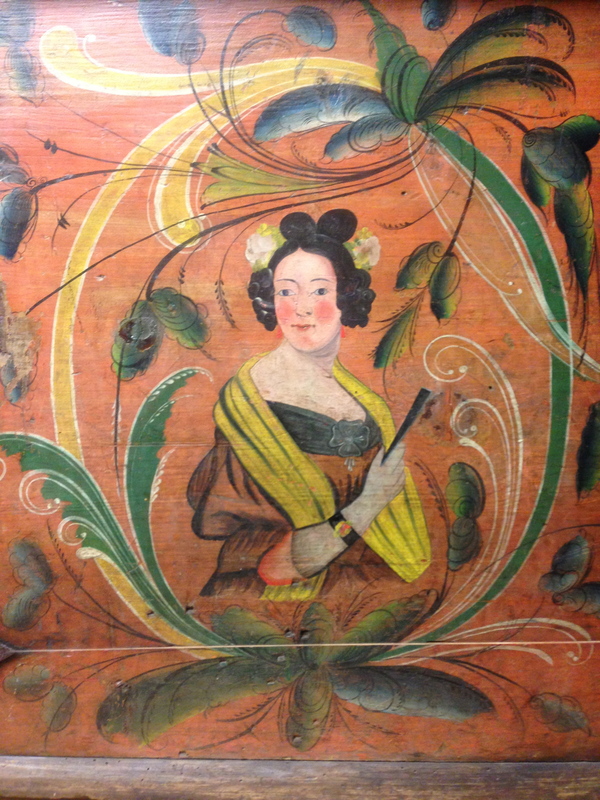 The technique almost died out, but a few textile historians—like Kate—are working to keep it alive. Interested in learning more? I highly recommend taking a workshop with Kate, who is both an expert and a wonderful instructor. 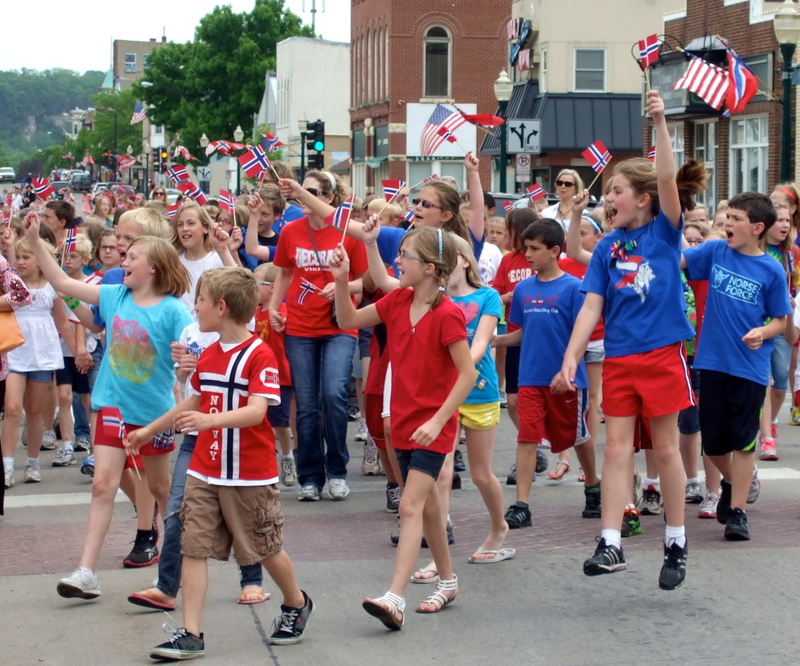 There’s a class scheduled at Vesterheim Norwegian-American Museum (in north-east Iowa) this summer. 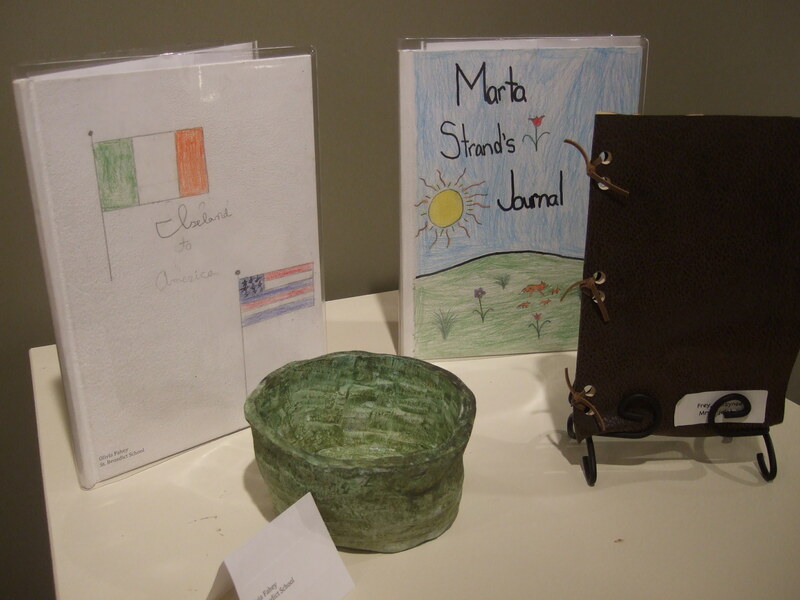 For more information, see their class description page. Next time, Part II – a peek at the class experience!